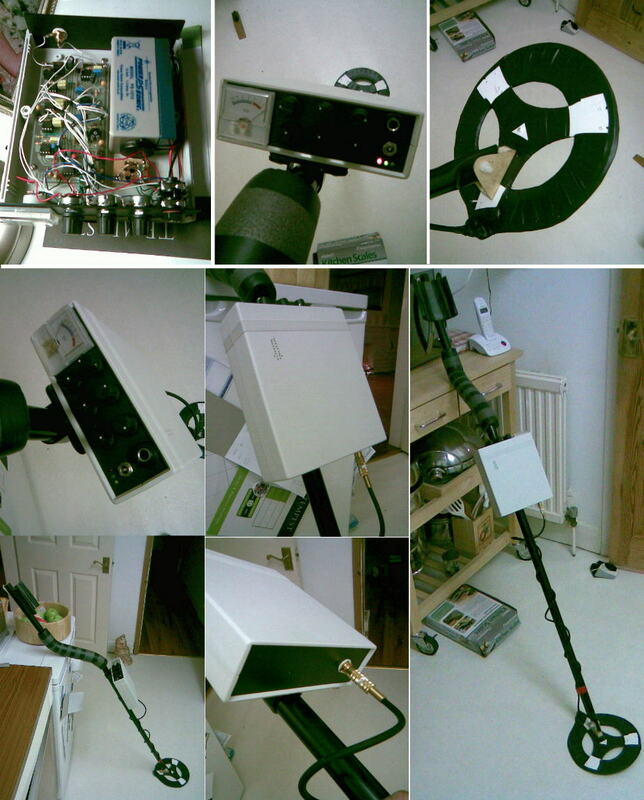 Some Pictures of my "PI Detectors" that have been Built by Hobbiests. Here are Picture of these Units that were Built! as of 2008, And I will show more Pictures as I recieve them! All Persons Comments will be posted, Even if they are negative in nature. to those persons that are interested. is MUCH Less than 0.1%. MANY THANKS TO ALL, WHO HAVE SENT ME PICTURES! The older ones are at the Bottom of the page. Most of the Pictures I have Recieved As of: "July 31, 2017"
David's, Metal Detector,   in New Hampshire, USA. David said its working well. James, Metal Detector,   in Pa, USA. James put it into an older detector case and it Looks Pretty Good. He says it works now, But he still needs to make a Proper Coil for it. Thanks for the Pictures James and I hope for some Updates when you get a proper coil made. William's, (Bill) Metal Detector,   in Pearland, Texas. 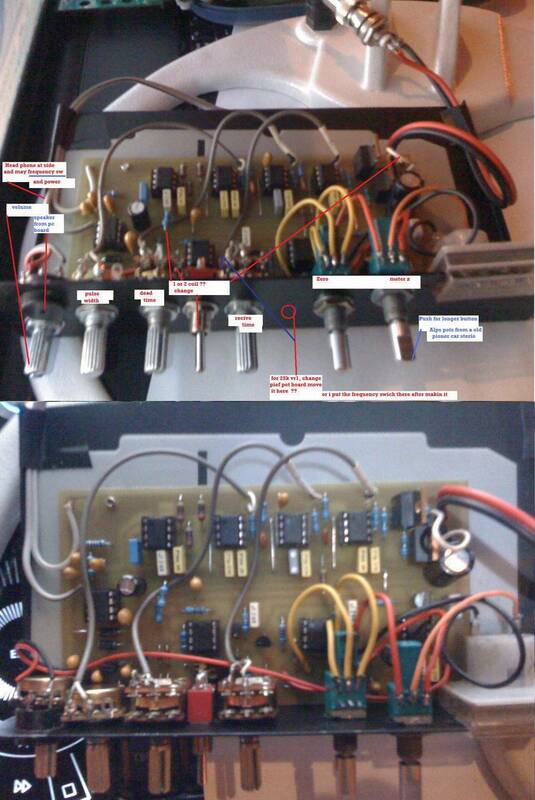 He had a few problems with the PCB and I Repaired it for him. Bill says it works good now and it happy with the detectors Sensitivity. Thanks for the Pictures Bill. 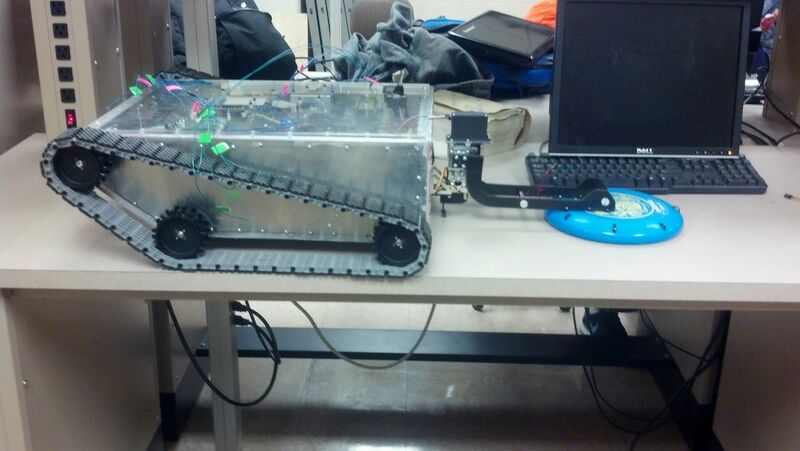 Kayla's, Metal Detector on a Robot,   at the College of Engineering in Illinois. This picture is at the Start of this Project, However the Completed Project was built by Numerous other persons, all working together. Kayla's job was to get the Metal Detector working. Video of this Completed Robot in operation, Showing its Ability to pick up Objects. Overall, Everyone were VERY PLEASED with the Results. Thanks for the Pictures and GOOD WORK to Kayla and all the other Persons involved in this project. 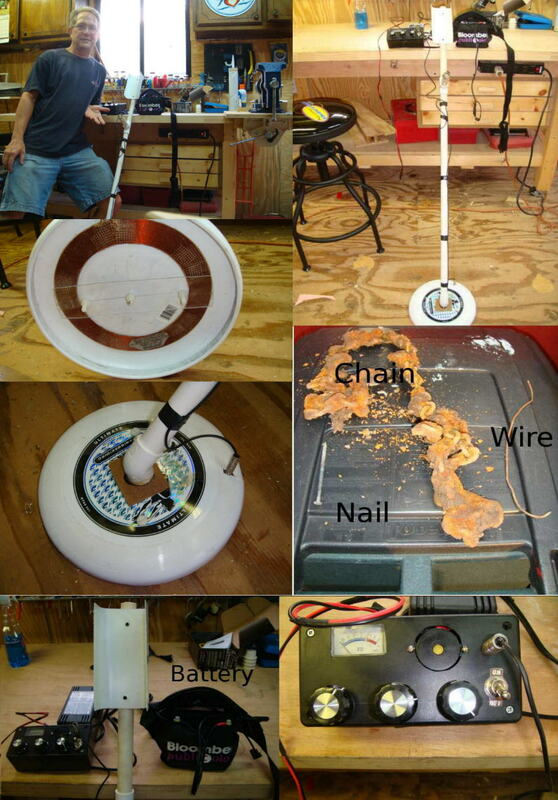 Josh's, Metal Nail Detector,   in Texas.I Custom Built this Detector for Josh so he could detect NAILS in Lumber before Cutting or attempting to Plane it. It is powered by a 110vAC Wall adapter, so n batteries. 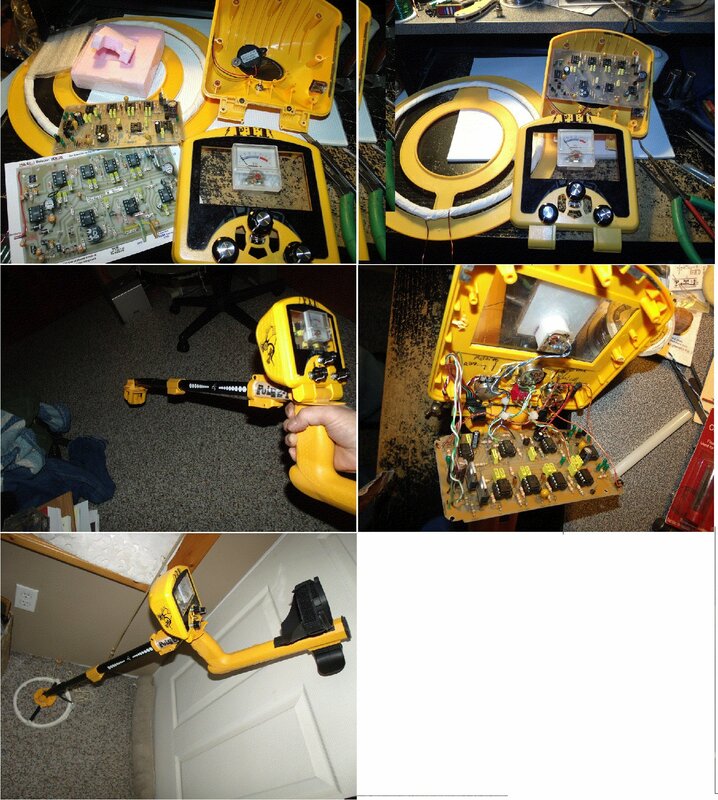 Josh gas tried Many other Detectors, But still getting damaged saw blades, etc from Missing Nails in the Lumber. I just recieved feedback from Josh, and he says it works Fantastic. He is now planning on getting a Second one. Anibal's, Metal Detector,   in Uruguay. 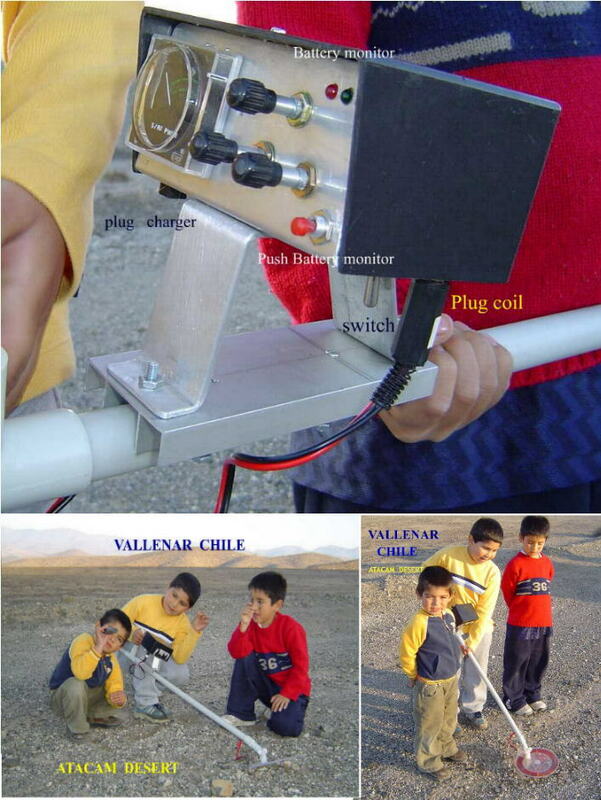 Anibal built this detector a few years ago, but just sent me these pictures now. He is Searching for Gold Coins and other stuff in old ruins. Thanks for the Pictures and good luck on your hunting. Juan's, Metal Detector,   in Chile. but we worked it all out. Juan says: It is working now and Quite Sensitive. UPDATED: Juan has sent some additional Pictures and Comments. 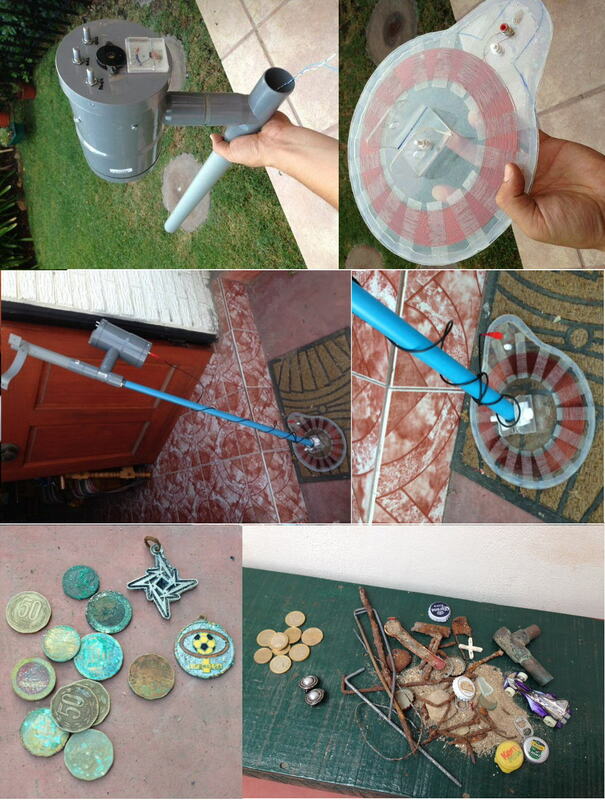 Juan says: "After One hour on the beach at "La Serena in Chile" here are the items I found with the detector". "I am VERY HAPPY with its Sensitivity". Thanks Juan for the ADDITIONAL Pictures and Feedback. Faraz, Metal Detector,   in Canada. without a board that shows whether or not the voltage has dropped below 12V. extra one to two inches of depth sensitivity; good to have as an option for fine pointing. Thank you again for all your help and of course the great circuit design! Thanks Faraz for the Pictures and your Comment. 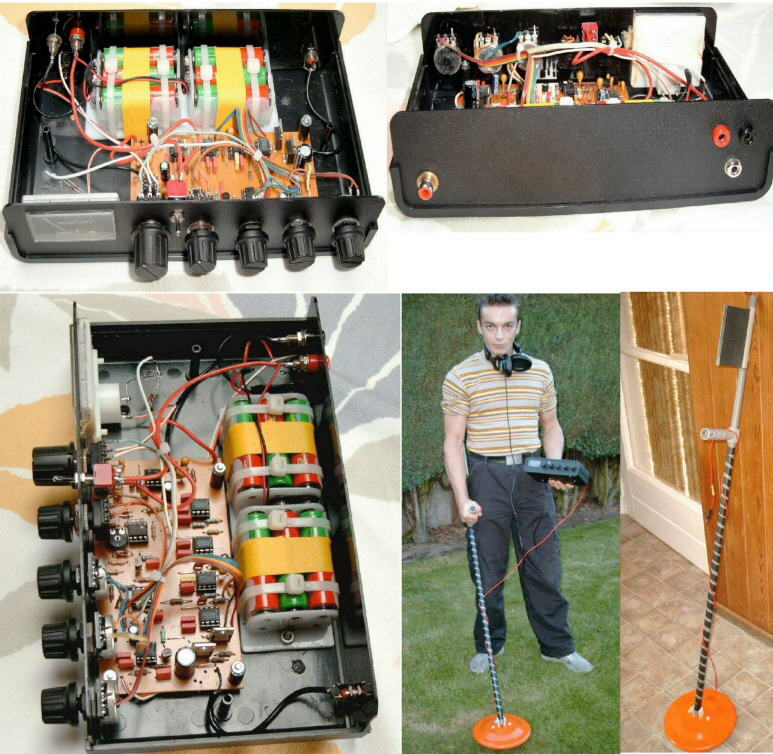 Pete, Another Metal Detector,   in England. 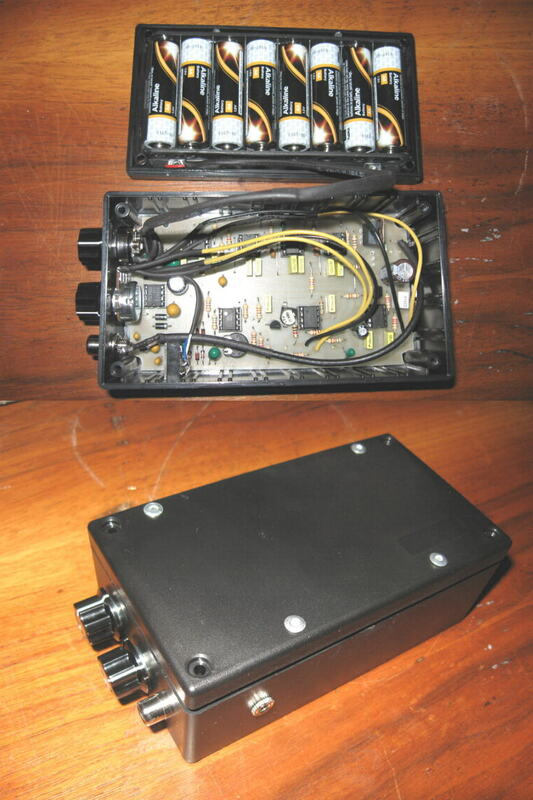 QUOTE: Here is a pic of the Pulse 1 with a new control box. Gone is the plastic see through lunch box and now has a single cable from coil to box as per. 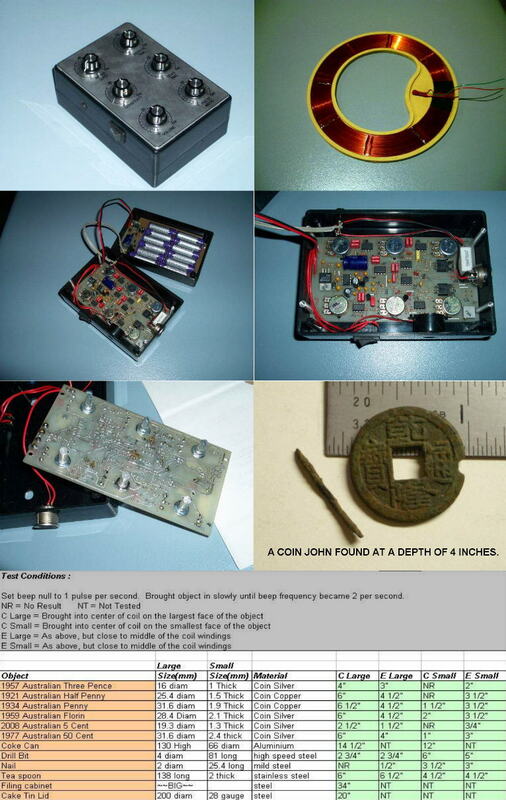 It can detect a 1 pence decimal penny on end at 9" in earth. The pulse 2 I also built has no problem down to 14" for same on boost mode. Used the small meter as supplied, Better and less adjustment than the larger meter for my daughter to use. THANKS Pete, for the Picture and Comments. 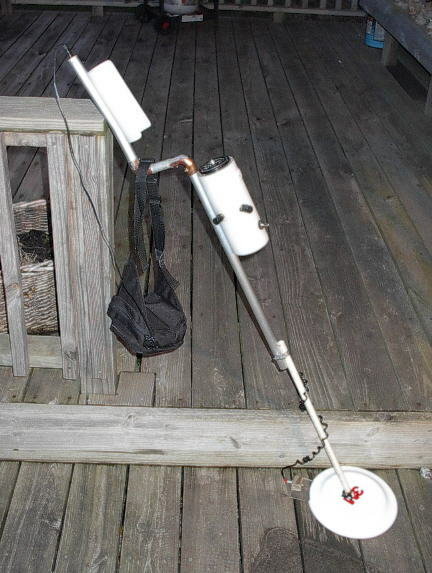 Ron's Latest Metal Detector"   in NJ, USA. 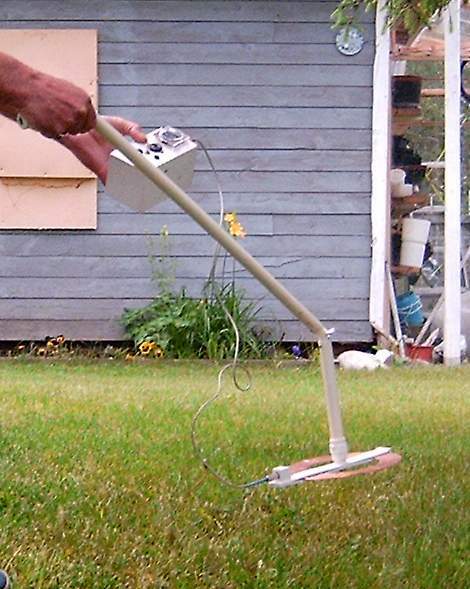 This is the second Metal Detector that Ron has made. 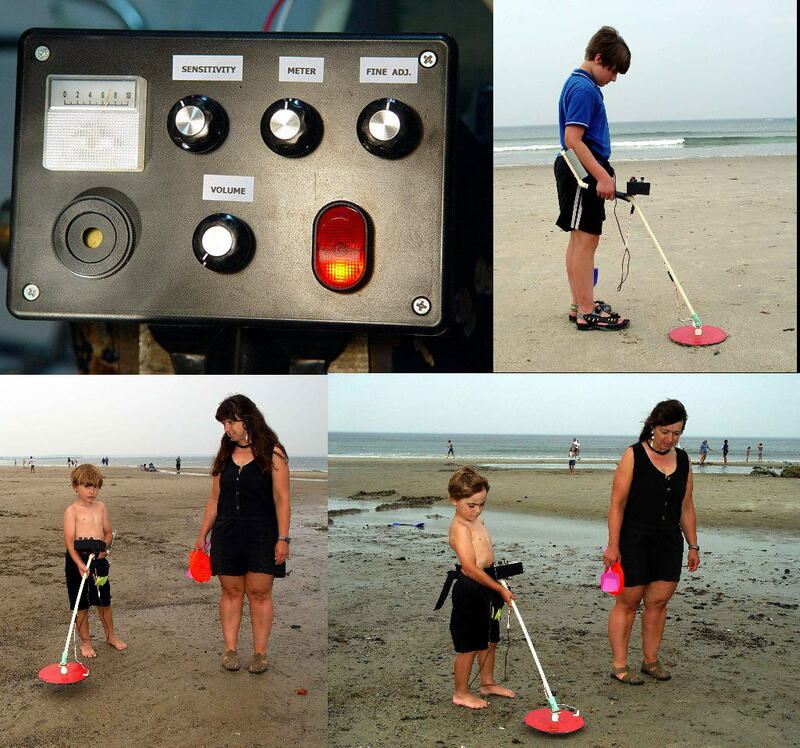 Ron's built his First detector in Sept of 2010, But it was distroyed in "Hurricane Sandy". made when he built his first detector in 2002. I took the detector out for the first time last week and I thought it worked well. I found a US quarter at about 7 inches and lots old beer caps, nails, and an old hammer head. The place I was searching at was where an old house once stood. 2 pieces of thin plywood and used all plastic hardware. I made a battery pouch, which I wear on my belt. With a small length of wire from the battery, I connect it to the detector box. Thanks Ron for the Pictures and you did a VERY NICE JOB on building it. 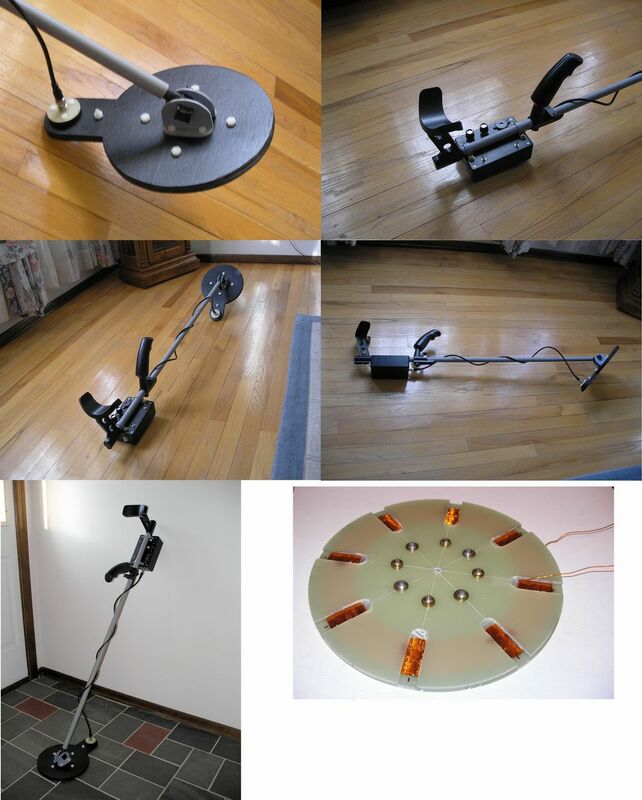 Rino's Metal Detector Creation"   in NB, Canada. I built and assembled the case and all the components in it for Rino. Rino built the Color-full Coil and did all the Final Assembly. 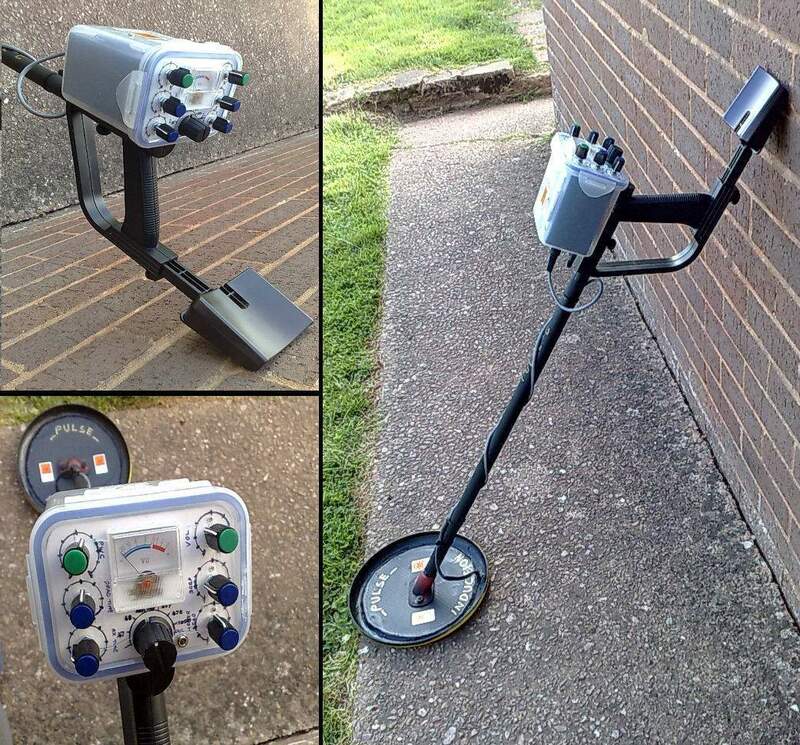 Pete's Latest Metal Detector Creation"   in England. Pete supplied his own meters on both these detectors. He says his Assembly time on this Detector was 2 Days. Pete's Metal Detector"   in England. Pete had a few problems getting it to work, but after Numerous Emails to me for help, the detector is now working good. He has not had time yet to do much searching with it yet. And now he plans to build another one for a friend of his. Here are the Pictures he sent me and I hope he will update me more on all this later. Dave's Metal Detector"   in Charleston, Sc, USA. Dave initally had a few problems getting it to work, but the detector is now working good. So far he has just found a few coins, but hopes for Better stuff. Here are some Pictures he sent me. 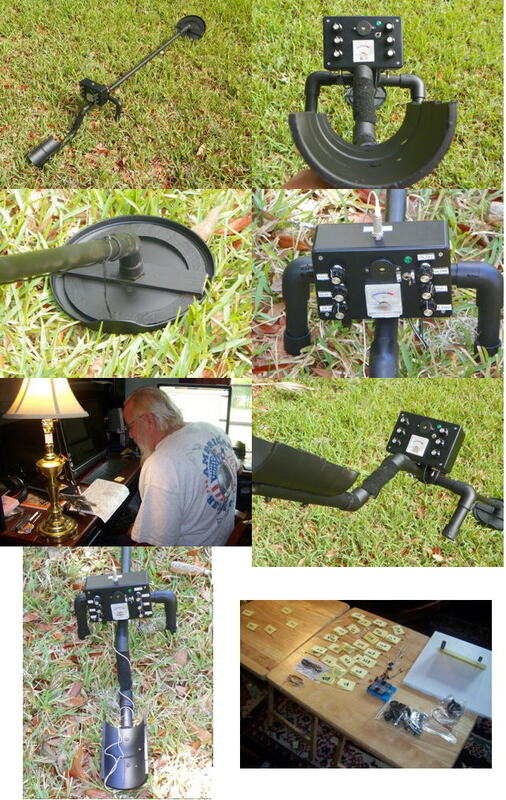 Mike's Metal Detector"   in Texas, USA. 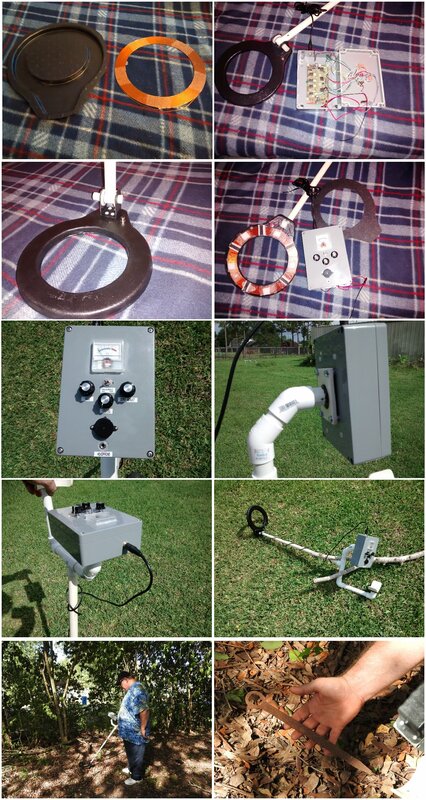 Mike origionally bought my detector kit in Nov, 2012. Now he bought two more kits in March of 2013. Here are Pictures of one of these he built from his second purchase. 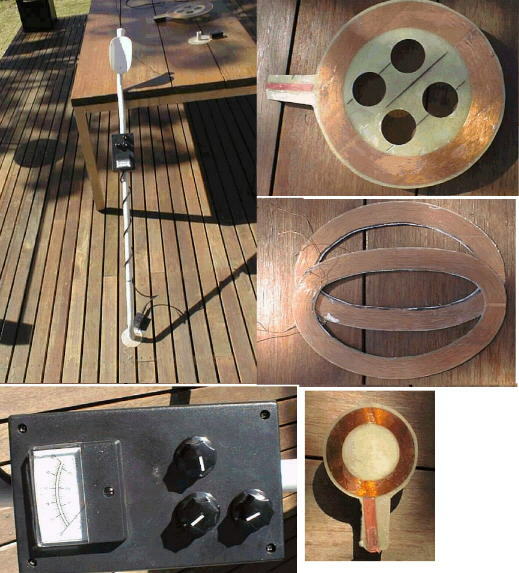 Dave's Metal Detector"   in Australia. 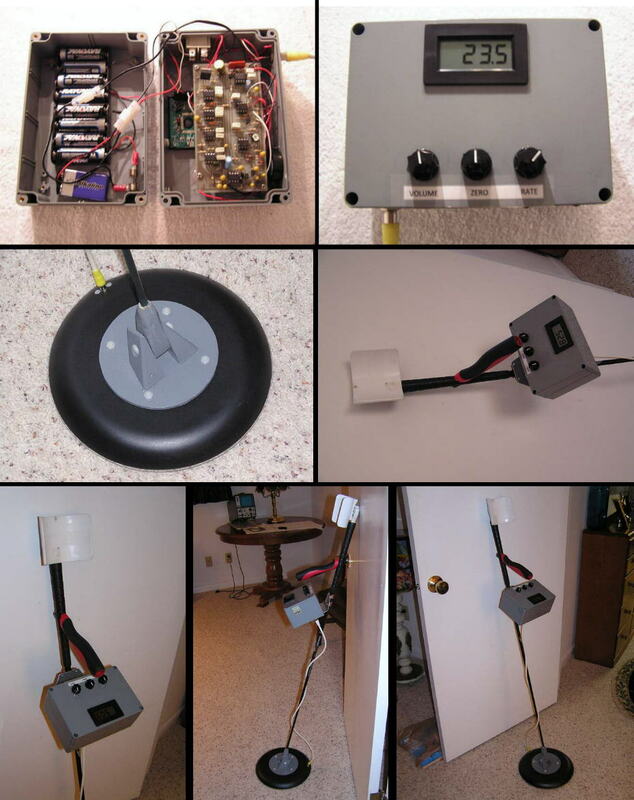 Attached are some pics of the finished detector. It is a beaut machine. Very happy with the results so far. No "treasure" found but plenty of trash and a few coins. This detector is more sensitive to small items than I thought it would be. Have found tiny fish hooks on the beach and will detect coins down to 8+ inches. for adjustments on the go. so I could run a ground connection to the shield of the wire and, if necessary, to a shield on the coil. It appears that no shielded is necessary. I used an old plastic plate as a coil bottom and just covered the top with plastic. The power supply is a small 12v battery I have on my waist to reduce weight. Mostly finished my detector today and thought I would send you some pics! This has been a very cool project and it really got me thinking ahead of time how to lay it out and where to put things. As I went some of my plans changed too. Very well designed board and I really liked the test points! The test points gave me a lot of confidence before proceeding that I built the board right. As you can see it turned out awesome! Still have some mods to do with a shielded cable and cutting some handle bolts off but about 95 percent done. initially then fiberglassed over it, and finished it off with some epoxy. Even wrote my name in between coats of fiberglass. in a backpack for some extended time in the field. end to end inside the tube! been buried in the dirtwork when we built our house 7 years ago. When I dug them up they were about 15 inches deep and the signal was still crazy strong! In air I am getting about 20 inches or so on a pop can and about 8 inches on a coin. cleaned up and back in order! Ed's Metal Detector"   in Richmond Virginia, USA. 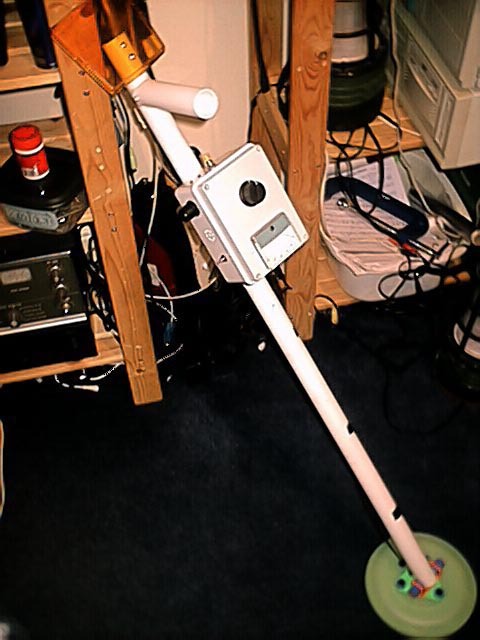 Ed says it works really well, "good strong reading with a Soda can at 20 inches in Air". Ed is now considering ordering another detector, so both him and his Grandson can search together. 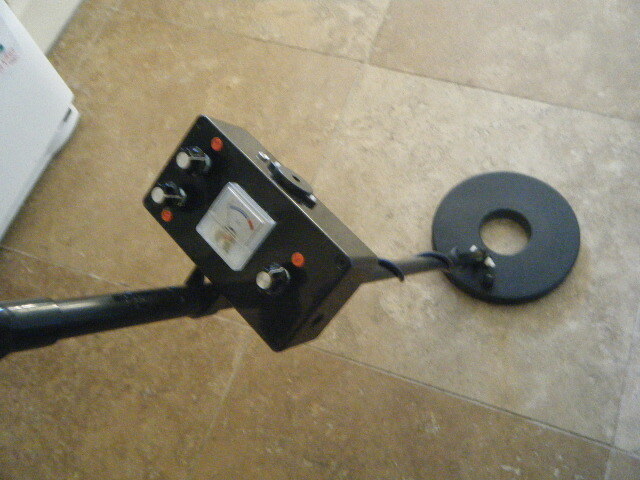 Roland's Metal Detector"   in California, USA. 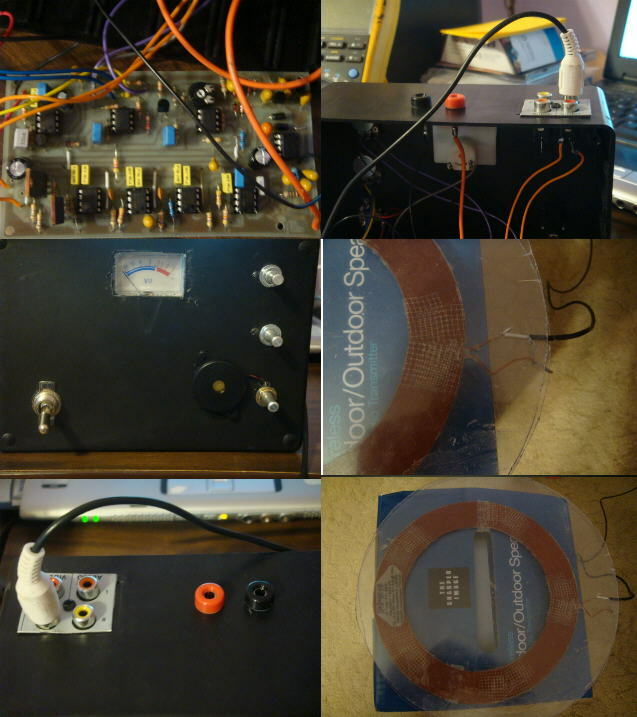 Roland is still working on making his 4 Foot Coil, But sent me these 2 Pictures for a start. His intentions are to find Meteorites and pull this Large Coil behind his vehicle. So Far, it is LOOKING GOOD, THANKS Roland. 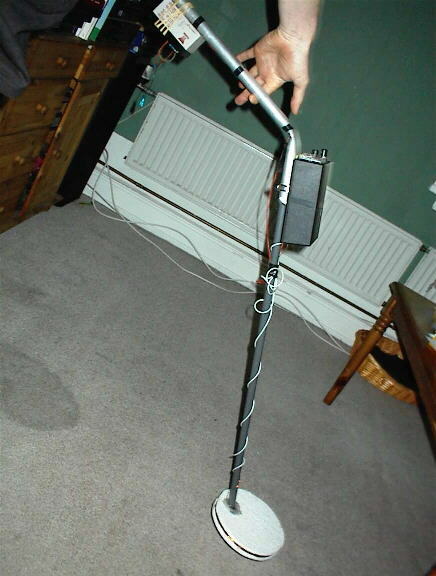 Steve's Metal Detector"   in the UK. 1p coin at about 9 inches in air. 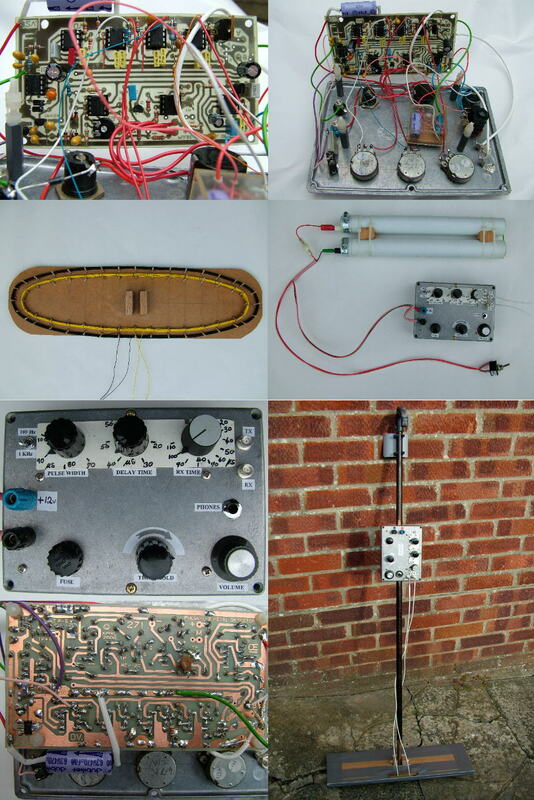 So don`t know how that compares with others that have built your p1..
knowledge,  although I do know which end of the soldering iron to hold I learnt this very early ?????. As I have said Gary is helpful and very patience ......................cheers. Paul's Metal Detector"   in Calgary, Canada. Paul Bought most of the parts from me but he supplied his own meter. 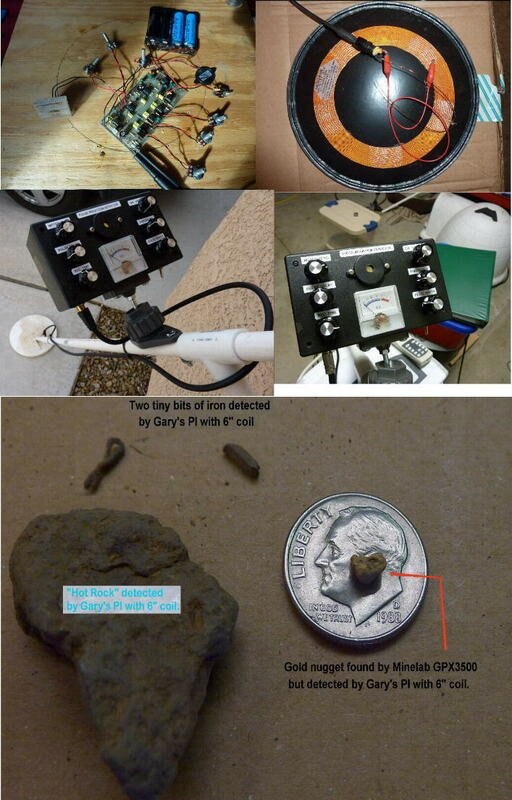 Paul says it works Very Well and he shows some of the Roofing Nails that he found in his back yard. He also said: "it did a great job picking up small staples, Twist Ties and even a few pennies". THANKS PAUL For these Pictures. Chris's Metal Detector"   in Pa USA. Ted Bought the kit of parts and is making his own coil. These are Just Two Preliminary Pictures, Chris says More are Coming. 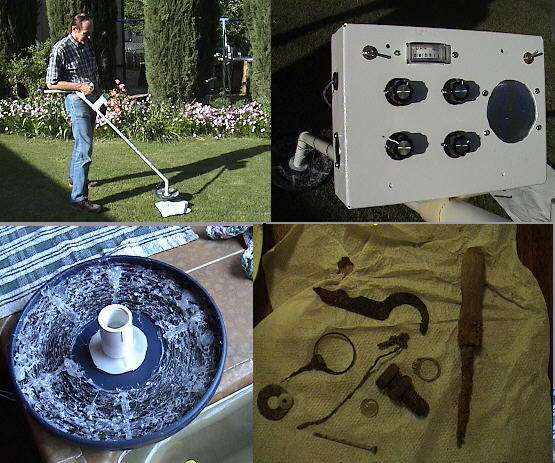 Ted's Metal Detector"   in Lawndale California USA. Ted Bought the kit of parts and an 8" coil from me, Quite Awhile Ago. I Forgot to Post his Pictures. Ted seems Quite Happy with the Detector. Sorry I Forgot, But there here now. 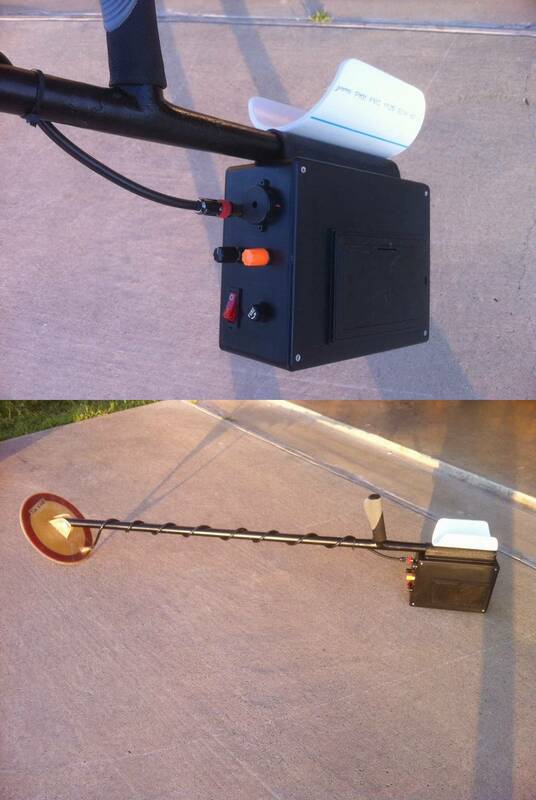 John's Metal Detector"   in Arizona, USA. Aluminum can at about 18 inches. He said he replaced the TL081's with AD711's. and got a slight improvement in sensitivity. ** I Also tried these AD711 IC's with somewhat Poorer Sensitivity than the TL081's. ** "Definately didn't justify the cost difference". He Also tried a Different fet for Q3, as he initally had poor sensitivity. kits so they should be good. Update: John has now purchase two 6" coils from me to try to detect Smaller Objects. One for my PI Detector and the other for a Commerical made detector. He was surprized as to how much more sensitive it now is to Smaller stuff. Thanks John, for the Revised pictures and other info. Randy's Metal Detector"   in the Belview Mi, USA. 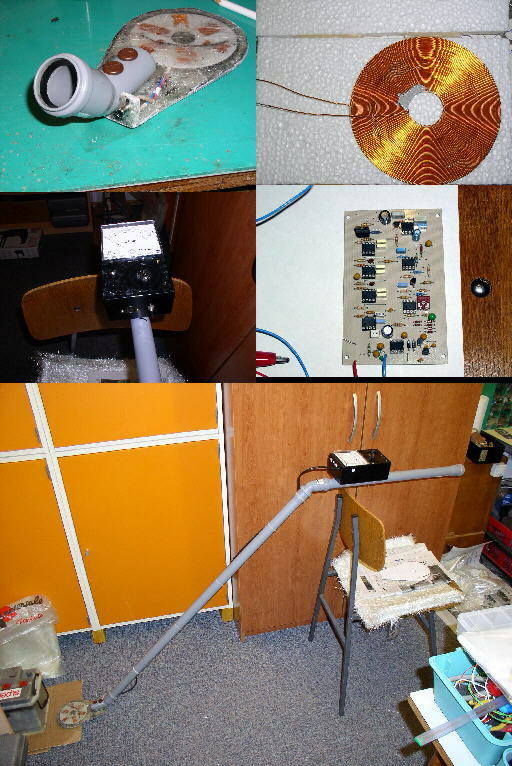 Randy actually built this detector in 2008, but just sent me these pictures in Dec 2010. 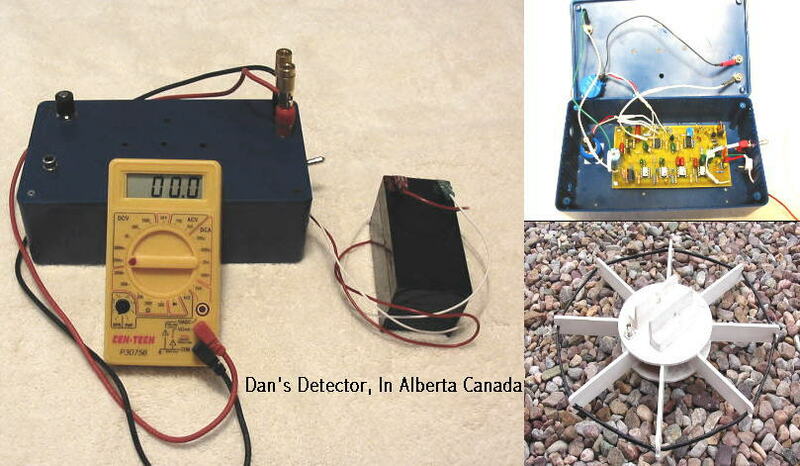 Randy uses this detector for Testing Coils that he makes. presently he is expermenting with "Dual Field" Coils. He has a Cell Phone battery pack and a Built in charger in his detector case. Thanks Randy, for the pictures and other info. 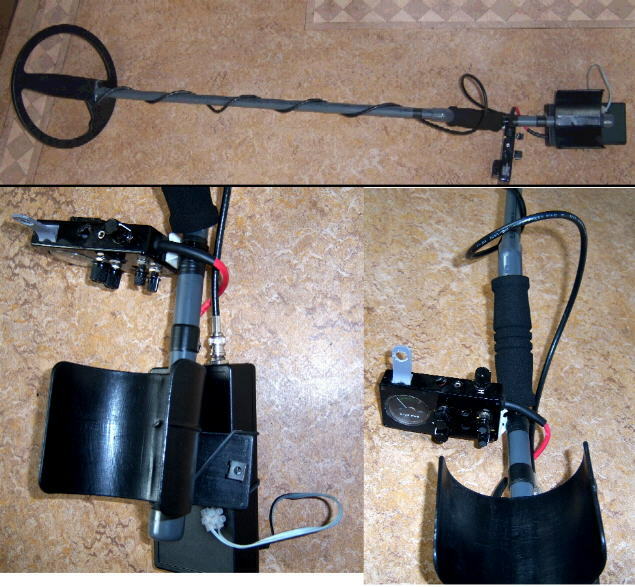 Bill's Metal Detector"   in Telford, PA.
causing some damage, so he returned it to me for repairs and now its working again. His Previous Picture are "Bill" lower down on this page. Here are some more pictures of it now. Happy Uunting a Thanks Bill. Stefan's Metal Detector"   in Silicon Valley, California USA. 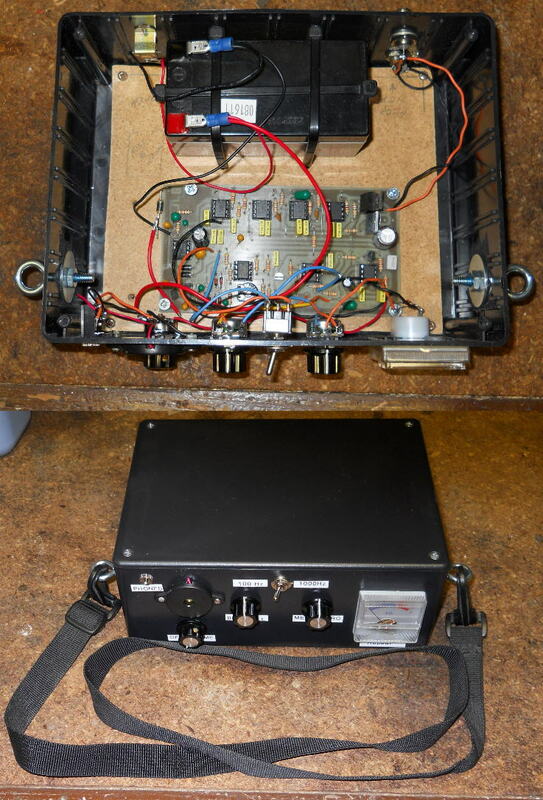 Stefan etched the board himself and built this detector using his own parts. Medium Density 1/8" thick Fiberboard. He says it detects a US, 25 Cent coin at 8 to 10 inches and a Car at about 3 feet. 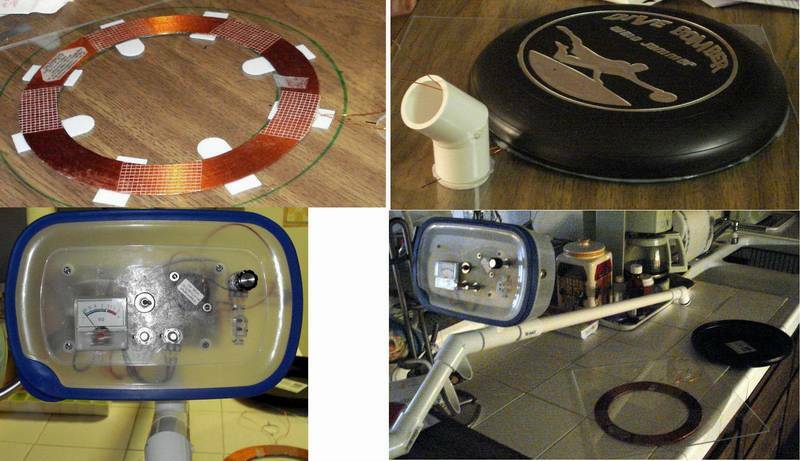 Now Stefan plans to build another Pulse-1 and a Pulse-2 for his family members to use. 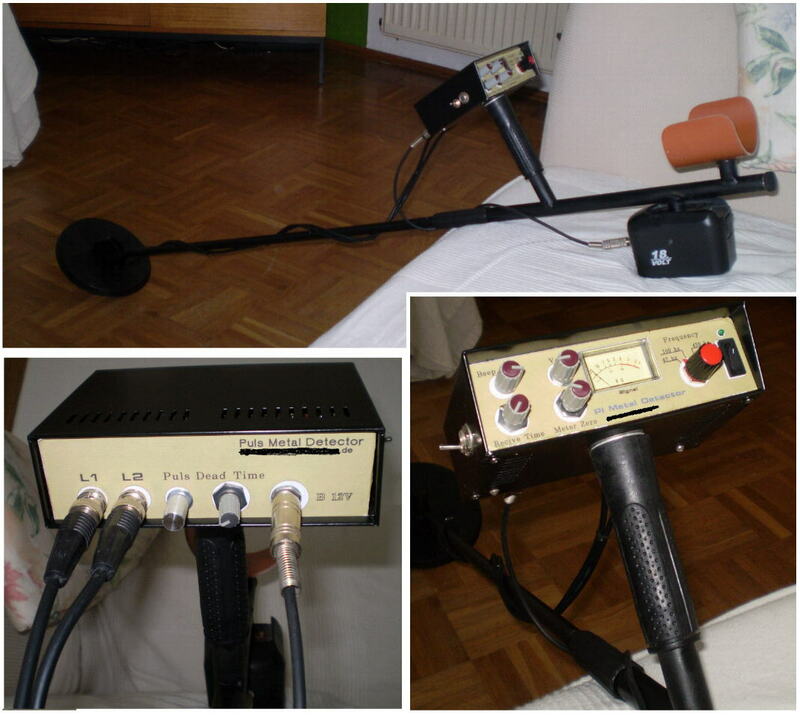 Thanks Stefan for the GOOD Pictures and your Comments on the detector. 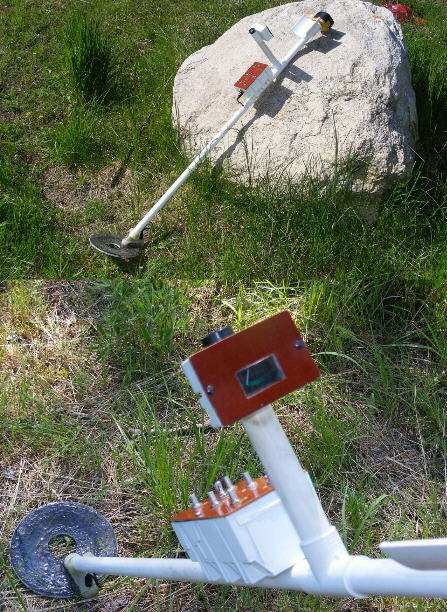 Vytautas's Metal Detector"   in Prienai, Lithuania. that he lost, And the Ring was found! Thanks Vytautas for the GOOD Pictures and glad you got your ring back. Tony's Metal Detector"   in Portsmouth, England. 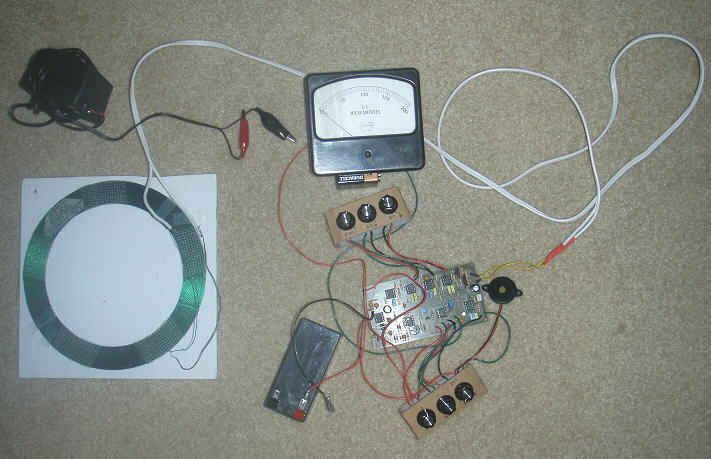 Diego built his detector from my kit and made a Seperate Recieve/Transmit Coil for it. His large, Transmit coil is 19 turns of 14 strands insulated wire, 20" * 6.5". And the inside Recieve coil is 70 turns of 24 SWG wire, 17" * 4". 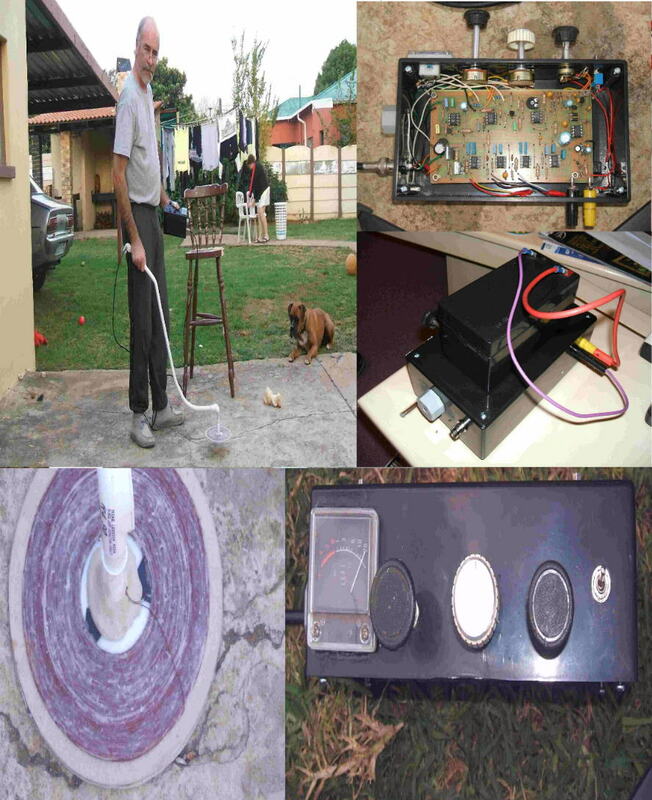 He is using a 1 Khz frequency and he because of this, he reduced R26 to .047.
of 80 us, works best. depth of 5.5 to 10"
but now is considering a smaller coil also, for Smaller coins and jewerly. Presently he is using Ten, NiMh "D" Batteries, but is now considering using the"AA"
Thanks Tony for all the GOOD Pictures and other Info. Diego's Metal Detector"   in Spain. 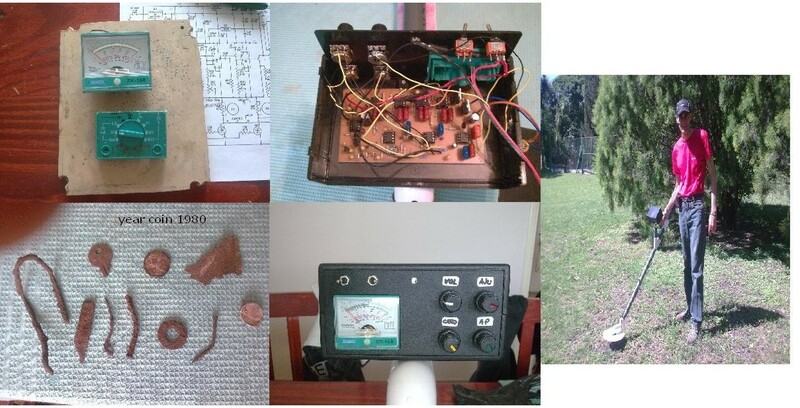 Diego built his detector from Scratch and made two coils. His 5.2" coil detects a 1 Euro Coin at 10" and a Pop Can at 17". His 9" Coil detects a 1 Euro Coin at 11" and a Pop Can at 18.5". Thanks Diego for finished picture. Daniel's Metal Detector"   in Bucharest, Romania. 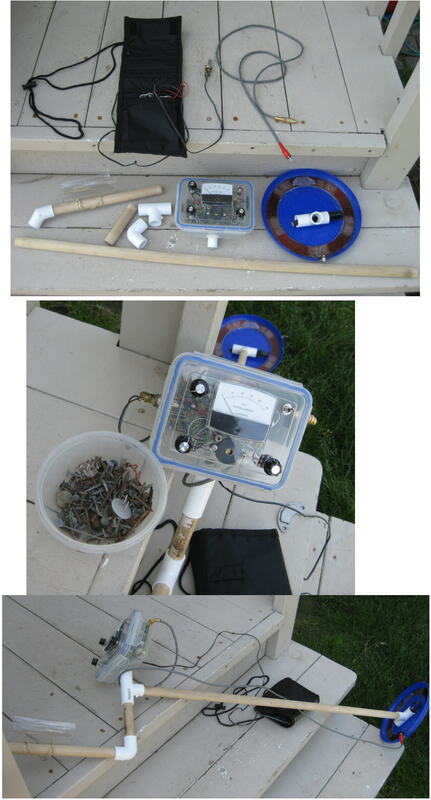 Daniel built his detector With a kit from me and says it was Fun to do. He says he is Very Happy with its Sensitivity and will be Field testing it soon. Nice Job, Thanks Daniel for the pictures. Joe's Metal Detector"   in Indiana, USA. Joe just bought the PCB and Coil from me. He has now Completed the Mechanical assembly. He says he can detect a "Bud" beer can at 22 inches and a US Quarter at 12 Inches. Thanks Joe for the finished pictures. LOOKS GOOD! Dean's Metal Detector"   in Australia. 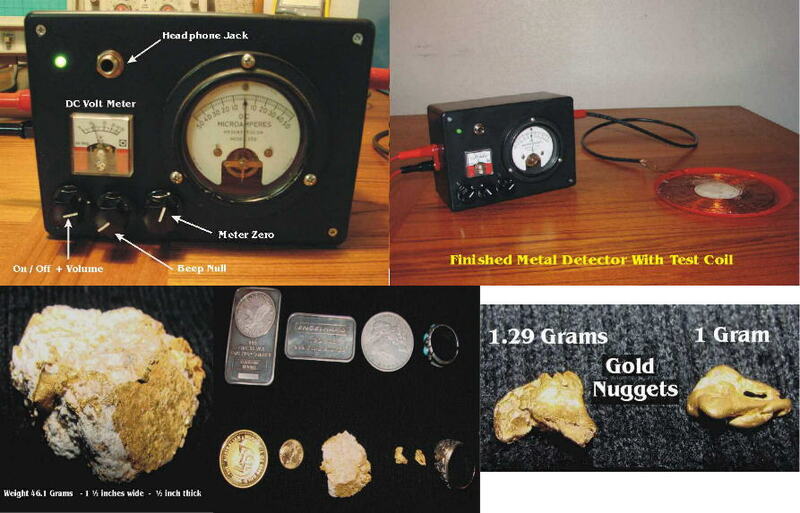 detecting a Pure, one ounce Gold bar at only 190mm. Dean says he has not found any gold yet, But numerous other Items. Augustin's Metal Detector"   in Sibiu, Romania. He Made the PCB and bought the parts himself. Fabrizio's New Metal Detector"   in Toscana, Italia. 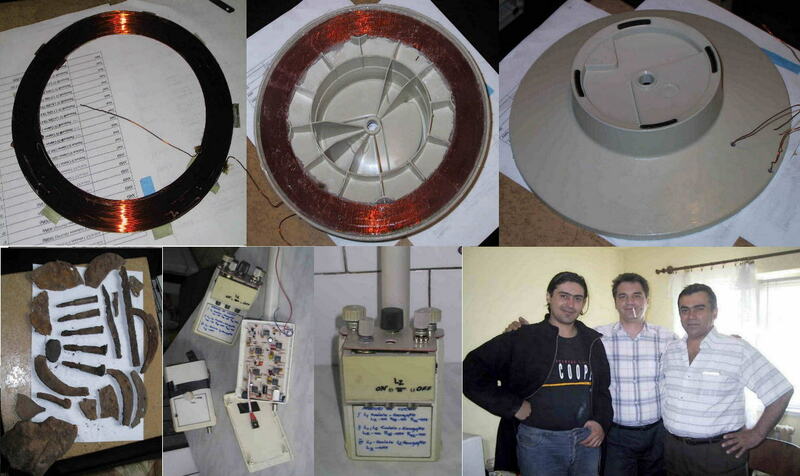 Fabrizio built this Second detector and he did a good job on the coils. 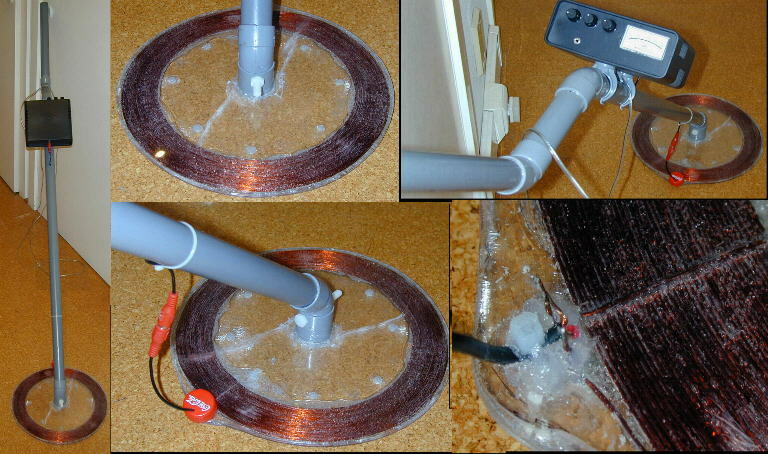 The Coil is a Seperate Recieve/Transmit (Tesla Wound) Coil. He says it detects a Small coin at 20cm and a larger can at greater than 50cm. Ken's Metal Detector"   now in South Sweden. 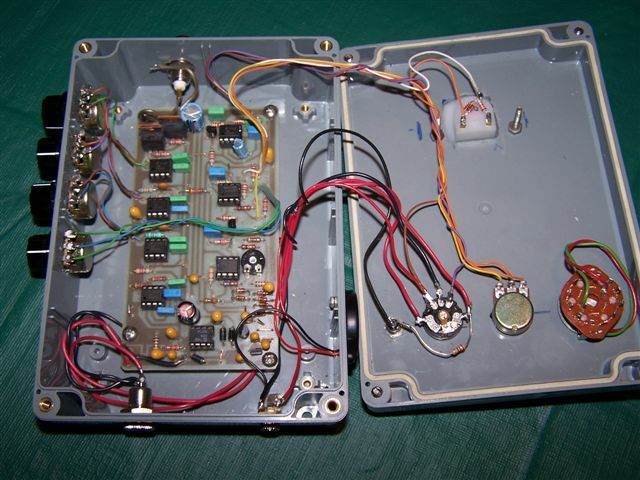 Ken built this detector himself and used IRF740's for the Output. 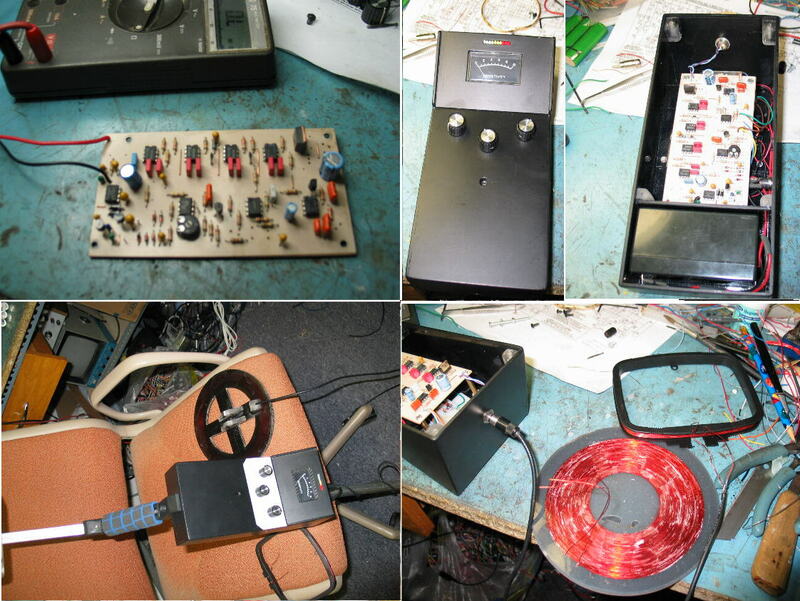 He also used a Factory made coil with 1200uH Inductance and 10 Ohms resistance. 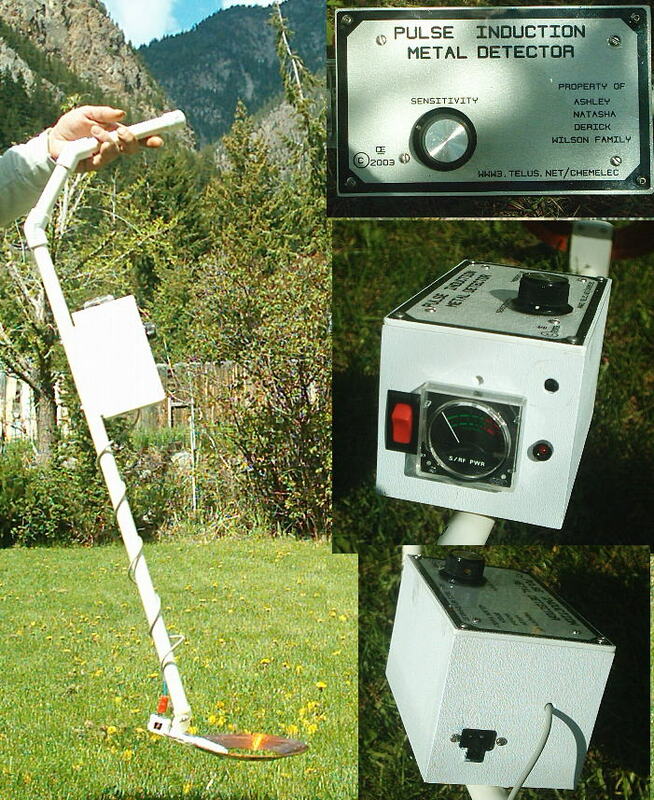 Maurice's Metal Detector"   in Canada. other for a Conveyer Belt. 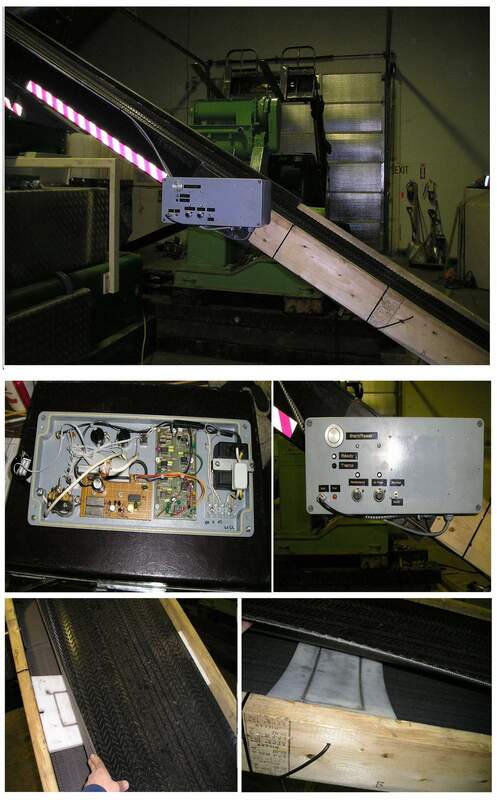 Maurices Comments: Here are some pix of my conveyor belt tramp metal detector. 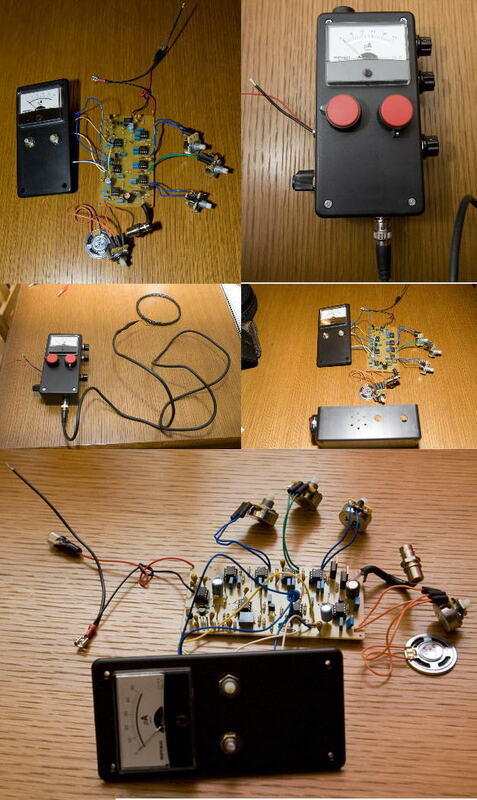 This is a slightly modified version of your pulse 1. I reduced the value of "R26 to 1 k". That increased the sensitivity considerably. I can reliably detect a dime at 12 inches. that matches the belt speed, and a latch circuit. The coil is 4" x 20" square with 20 turns #22 enameled, came in at 380 uH. 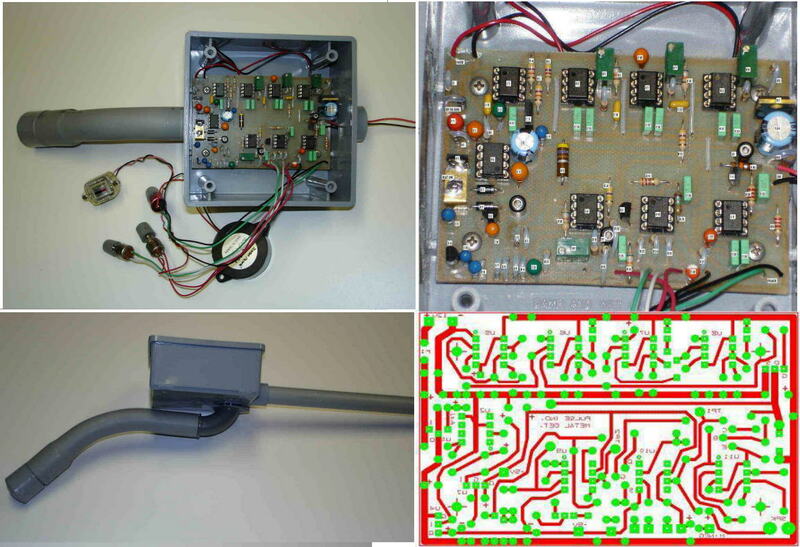 And he also created additional circuits to interface it for his system. Thanks Maurice for your Pictures and Comments. Sergio's Metal Detector"   in Brazil. 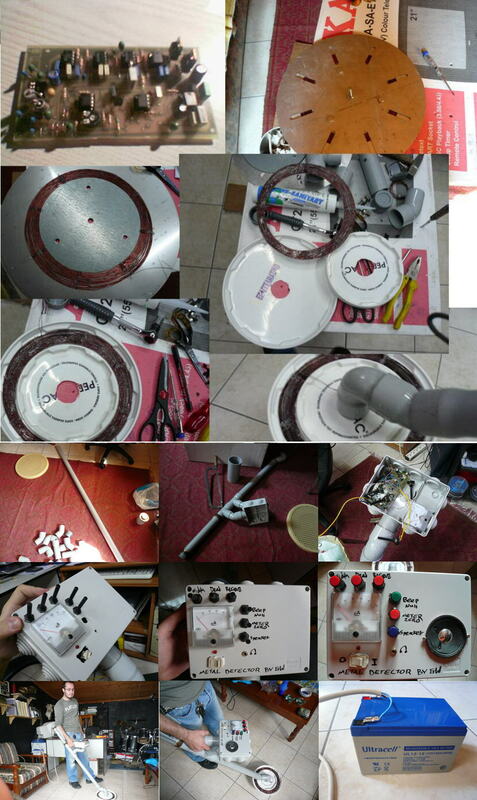 Sergio bought the kit from me, Without a coil or meter and built it up without any problems. Now Sergio wants another kit to build for a friend of his. 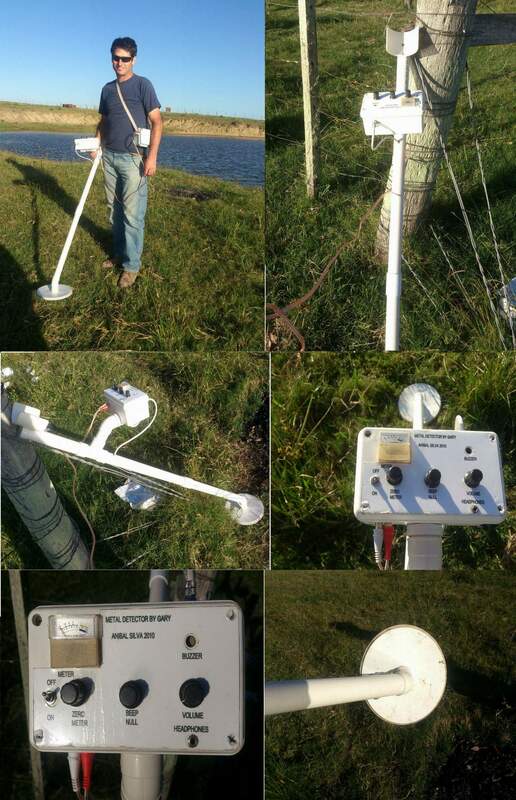 He says he detects a Euro Coin at 20 Cm, and a Pop Can at 40 Cm and a Refigerator at 1 Meter. Thanks Sergio for your Pictures and Comments. 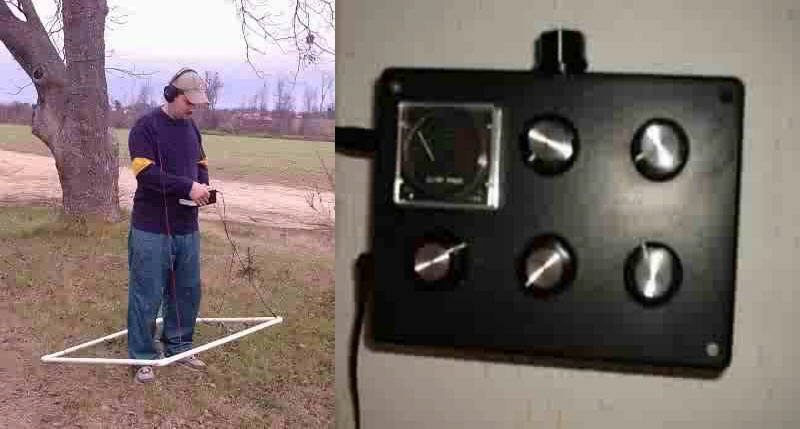 Steve's Metal Detector"   in Argentina. 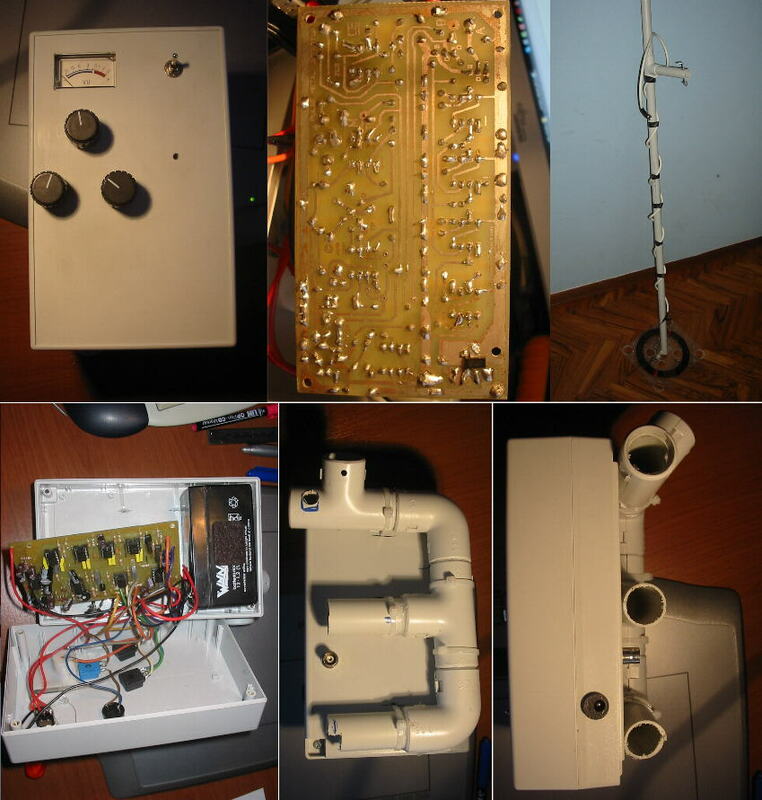 He built my detector with his own parts, and after a few problems, he now has it working. Biggest Problem in our discussions was the Language difference. 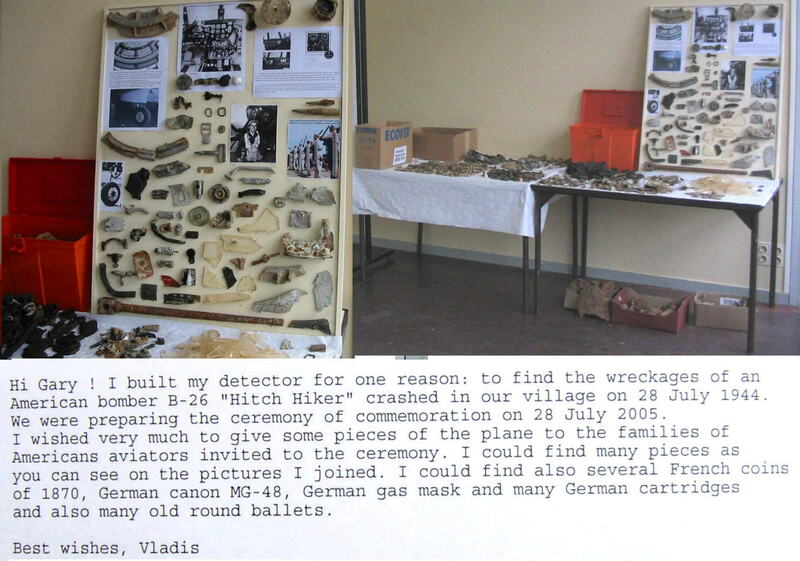 His Picture shows some of his finds. Thanks Steve for all the Pictures. 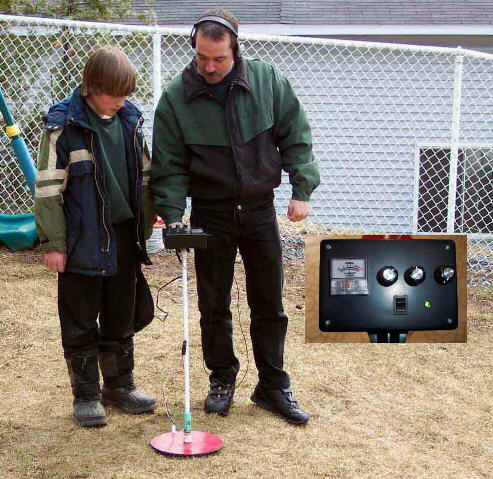 George's Metal Detector"   in Kitchener, Ontario. 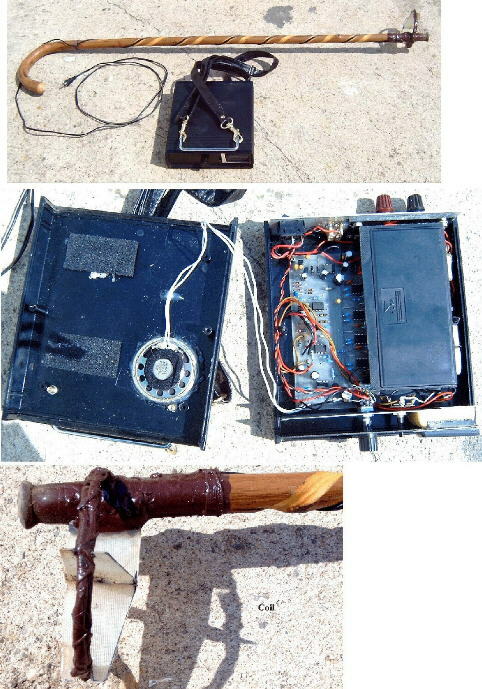 "I built this metal detector from scratch." "I am very impres how simple and powerful is.". Thanks George for the Pictures and Comments. Bob's Metal Detector"   in Coalville, Wa. Bob built this with all his own parts. His coil is a 8" Tesla wound Coil. He says he can detect a Pop Can at 22 inches and a Canadian Quarter at 11.5 inches. 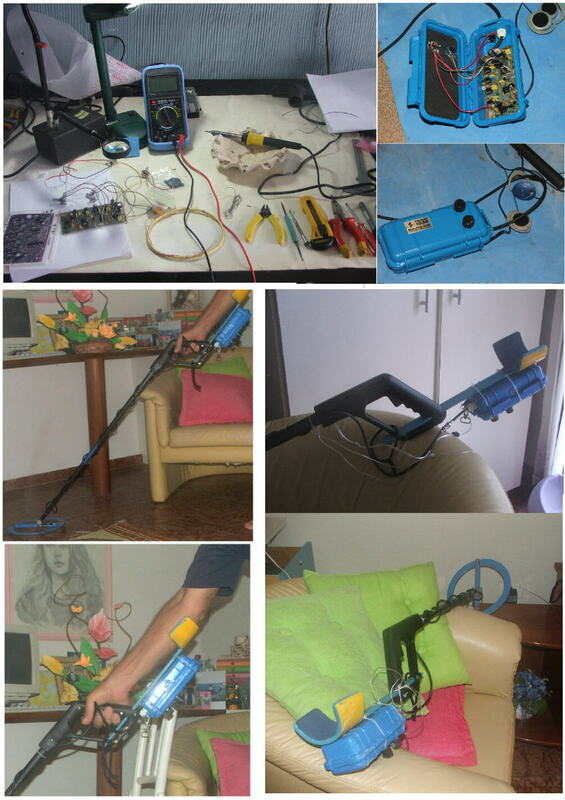 George's Metal Detector"   in Larissa, Greece. George built this with all his own parts. He says he's happy with the results and he sent Lots of Pictures. 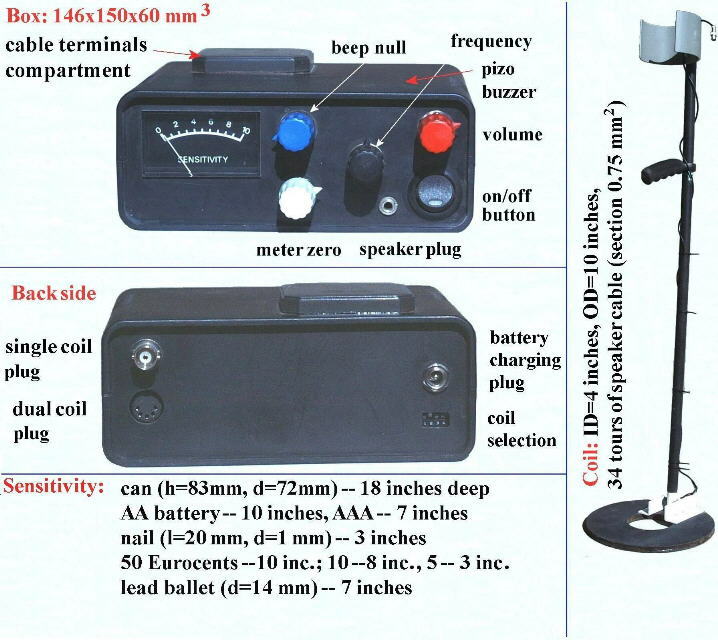 His Coil is 20 CM Diameter and 47 Turns, 0.5mm wire. 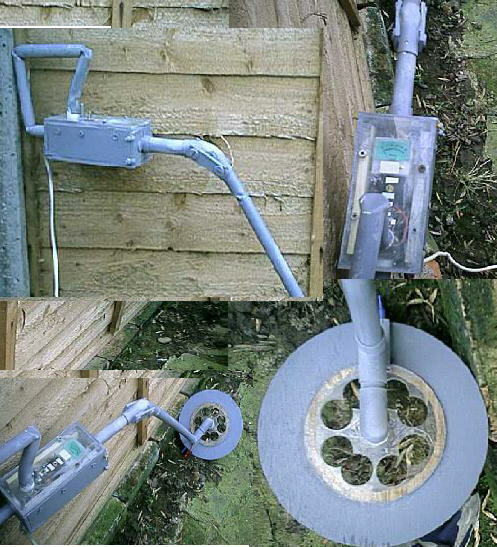 Russell's Metal Detector"   in the UK. Russ bought the Complete Parts kit from me, and he did a Nice Job in making it look good. Russ says he can detect a "5 Pence Coin" at about "10 inches". Very Good Job, Thanks Russ. Angelo's Metal Detector"   in Italy. 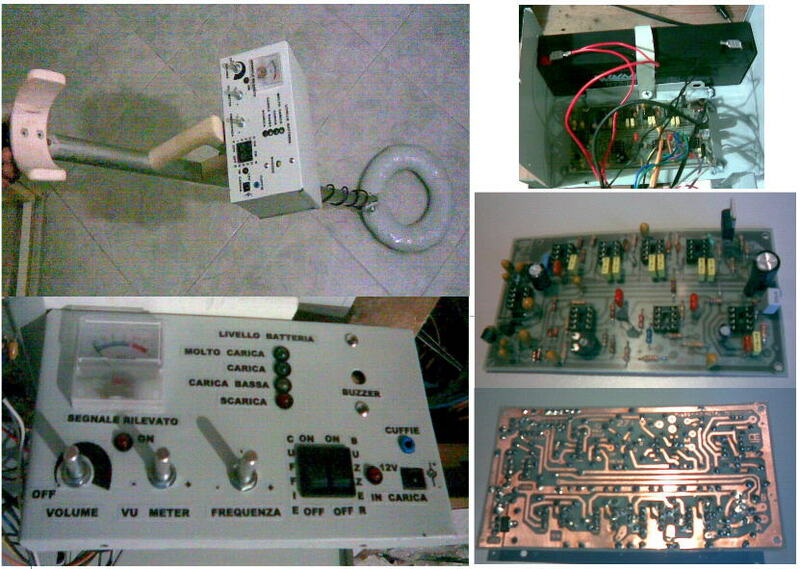 Angelo only bought the PCB and regulator from me. As he has a problem with its operation that he hasn't been able to solve. Graham's Metal Detector"   in Huntington, North Yorkshire, UK. 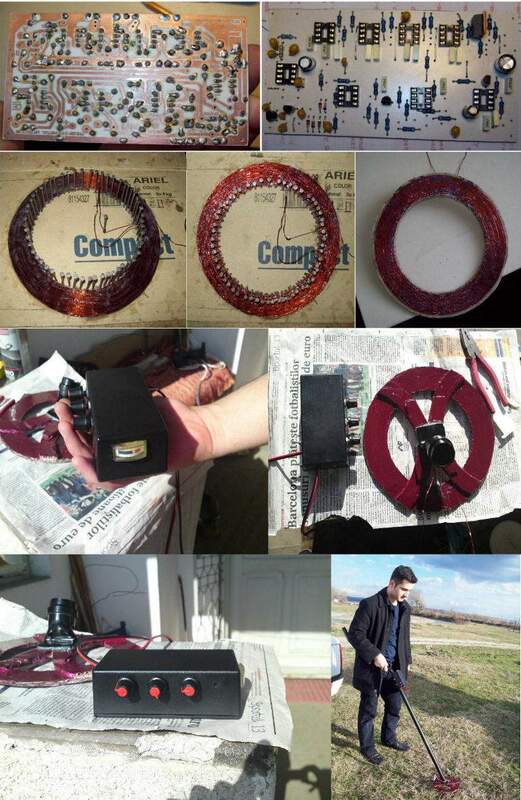 Graham bought the kit of parts from me, but made his own 32 turn coil. Not Sure What diameter coil, (looks Smaller) but 32 turns of 22 SWG wire. He's really happy with the results and says he detects a gold ring at about 7 inches. Roy's Metal Detector"   in Beaumont, Tx. Roy bought the 8 inch Coil and kit of parts from me. He's really happy with the results so far, but needs to finish it off. Hopefully he will send more pictures when complete. 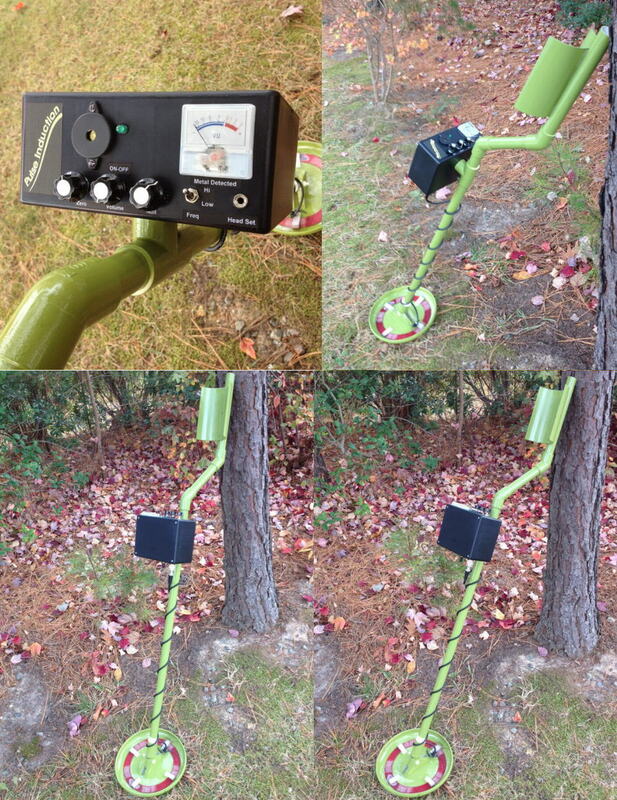 Pascal's Metal Detector"   in Atlanta, Ga.
Pascal built it all himself, from scratch. He had a few problems at first, but now its working good. Now he's working on a better coil. George's Metal Detector"   in Romania. George built it all himself, from scratch, and says it works good. Bob commented that he can detect a Pop Can at a minimum of 17". He also said he got best sensitivity with VR1 set at .8 Volts on pin 6 of IC9. A Few Pictures here, but still working to get it properly assembled. Calin's Metal Detector"   in Germany. Calin's Only Comment was "Super Projects". Thanks for the pictures Calin. 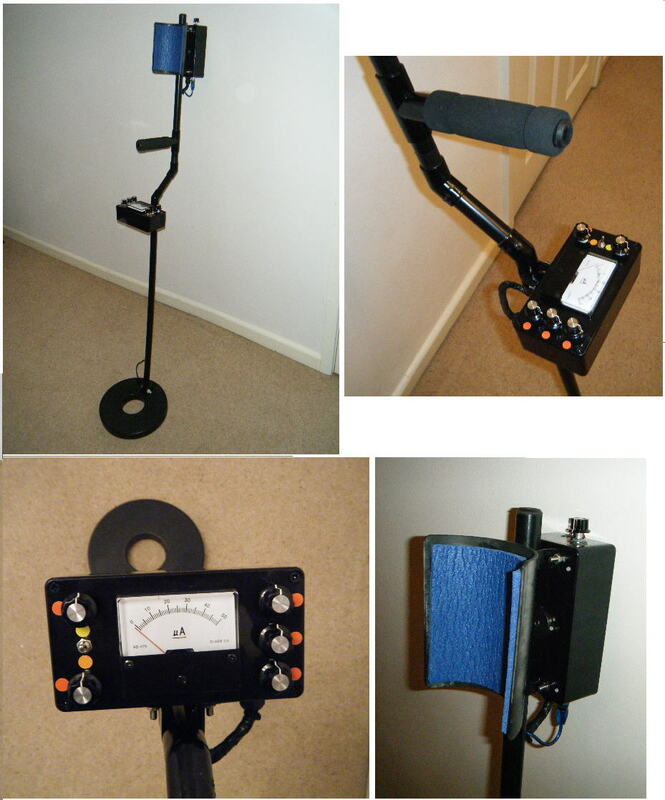 John's Metal Detector"   in Australia. Ni-Cad batterys and he added a simple charging circuit on the PCB. The Pictures John sent, shows his unit and some of his test results. "A Very Professional looking unit John. have also designed it this way. And also not everyone wants the same layouts. Fabrizio's Metal Detector"   in Toscana, Italy. Fabrizio says his detector detects a 5 Eurocent coin at 20 CM. He is now making a new coil for it to try for even better results. 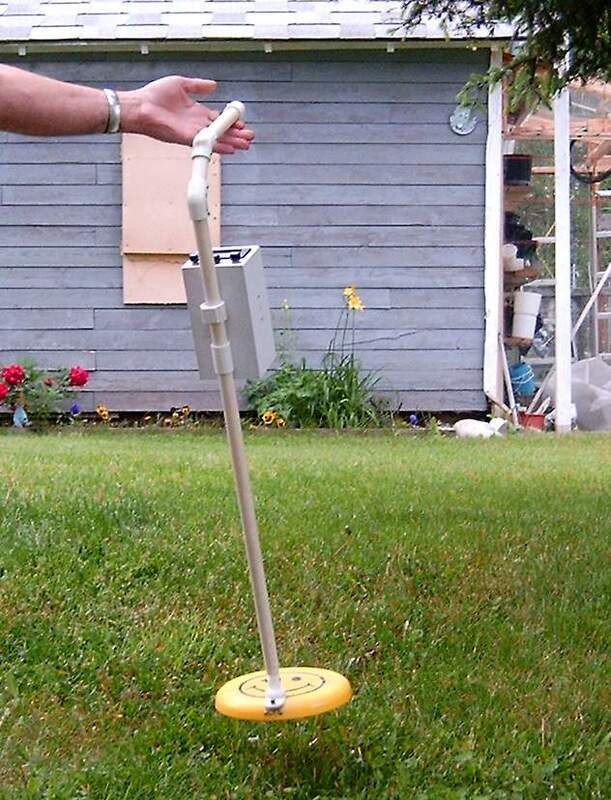 "Vladis Metal Detector"   in France. but just sent me this picture on "Mar 13, 2008". Vladis also created the Picture with his comments on it. By request, he than sent me a picture of the items he found. I posted these along with his email explaination of it all. Better late than never and It "ALL Looks Very Professional". THANKS Vladis! Adrian's Metal Detector"   in Kent, UK. 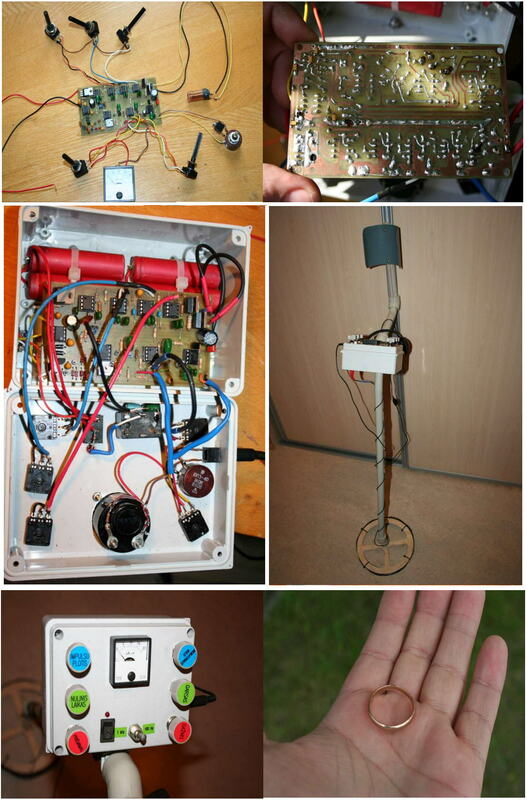 Adrian built this detector himself using his own parts. He just bought the Circuit board from me. for him to do this. The Batterys are in a seperate box, Not shown. Adrian also made a very Favourable Comment on the performance of my flat coil design. but there was a lot of swearing as he tried to make it. However he is Very happy with the final results using it. "I can clearly detect a "Bean Tin" sized aluminum light fitting at over 27 inches". 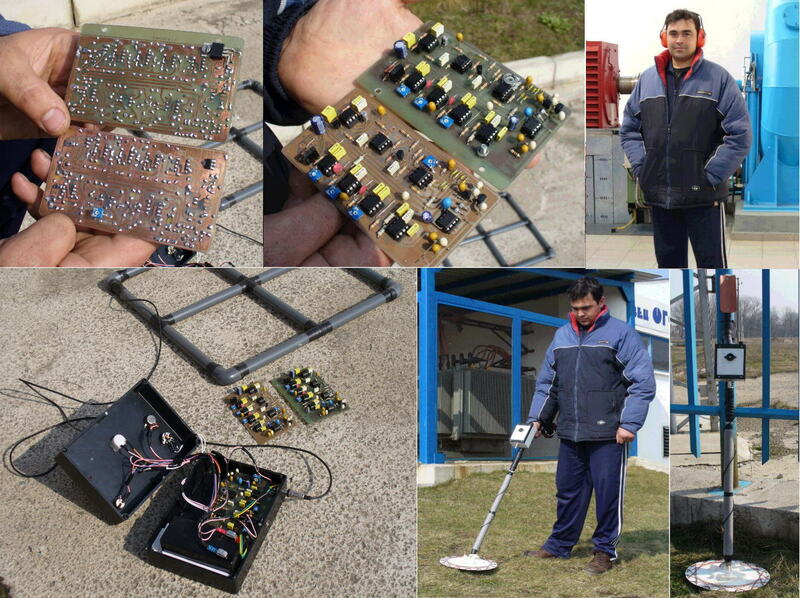 Plamen's Metal Detector"   in Bulgaria. 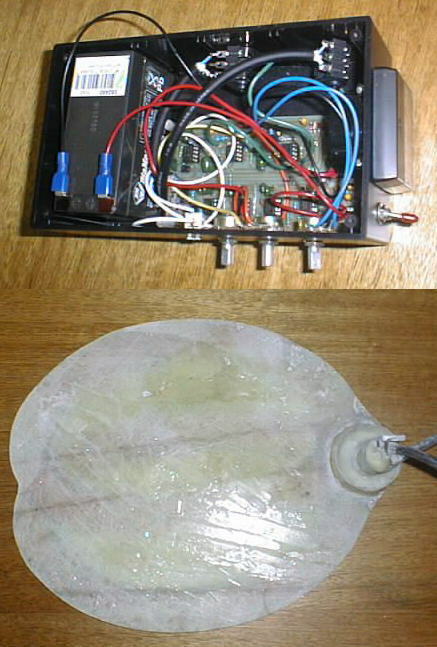 Plamen built this detector himself, including making his own circuit boards. Nice Job and Nice Pictures. 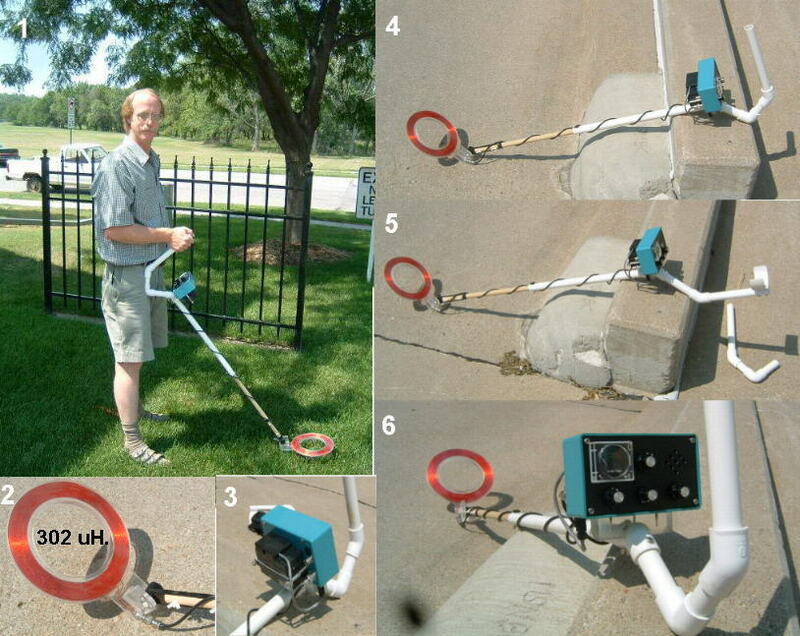 Don's Metal Detector"   in Lakewood, Colorado. Here are his Comments as in his Email. outcome when I know full well that my test coil is not perfect. 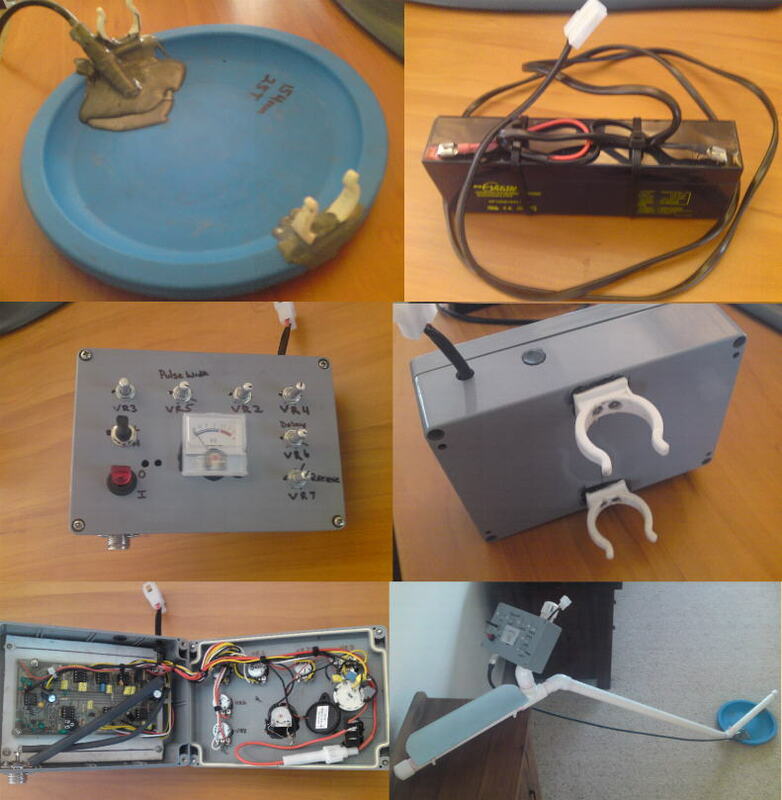 items used to test the detector. was sufficient and correct. I also added an ear phone plug as an option. VR thinking that would solve the problem. It is improved but still way to sensitive. Any ideas you may have on this will be greatly appreciated. experimenting with better wound search coils of various configurations. ** My Note: I have never had this Problem. I think he has an error somewhere. go for elliptical or rectangular setups. better than this, now that I have pure gold to use for setting it up. And I will be doing so this coming winter. Joe Built this detector. His comment was it works Good. Joe says he can only get 11 inches on a 25 cent coin. 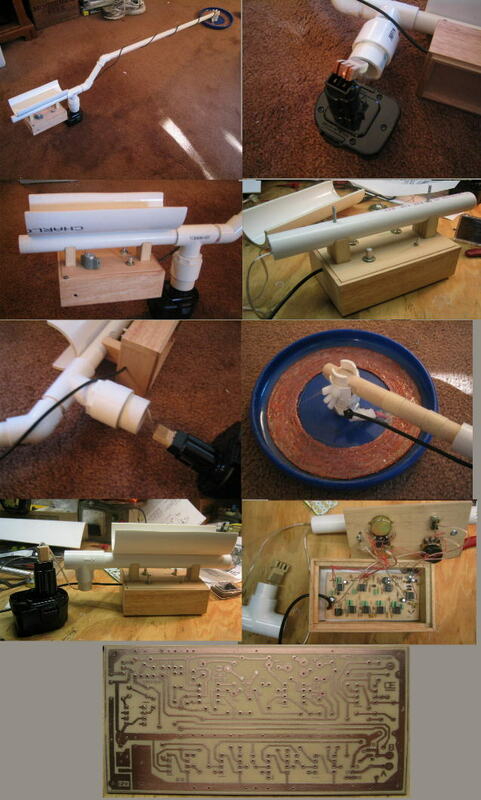 It is housed in a thin wall PVC Pipe. Update: Origionally Joe Built this in July, 2006. Joe now Realized his pictures were lost, so he was good enough to contact me and Replace them on June 16, 2015. And Joe now lives in Donalsonville, Georgia. 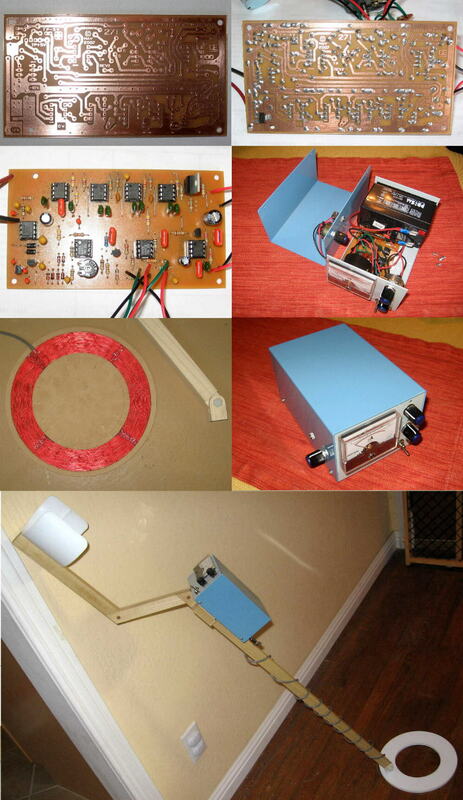 Tenis Built this detector from Scratch, including the PCB. His comment was he can also detect a coin at 12 inches. 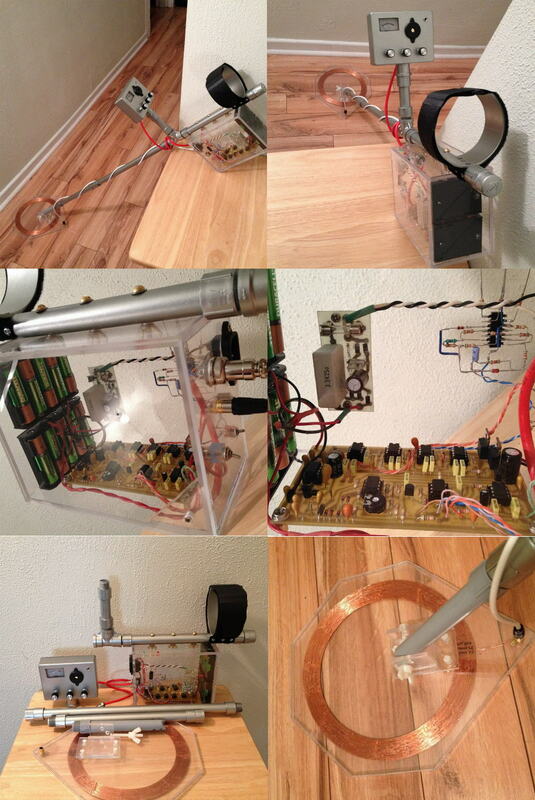 Javier Built this detector from Scratch, including the PCB. His comment was it works Good. Javier also said he made some modification on it to better suit his needs. 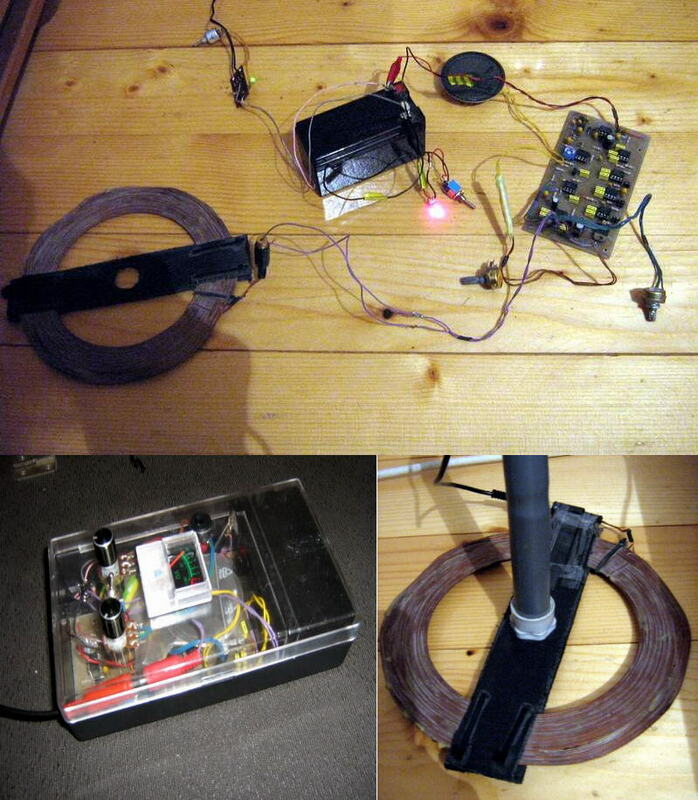 Daniel Built this detector from Scratch, including the PCB. I Believe Geoff supplied all his own parts. about 1.5 inches. Also a Plain Gold Ring at about 9 inches. 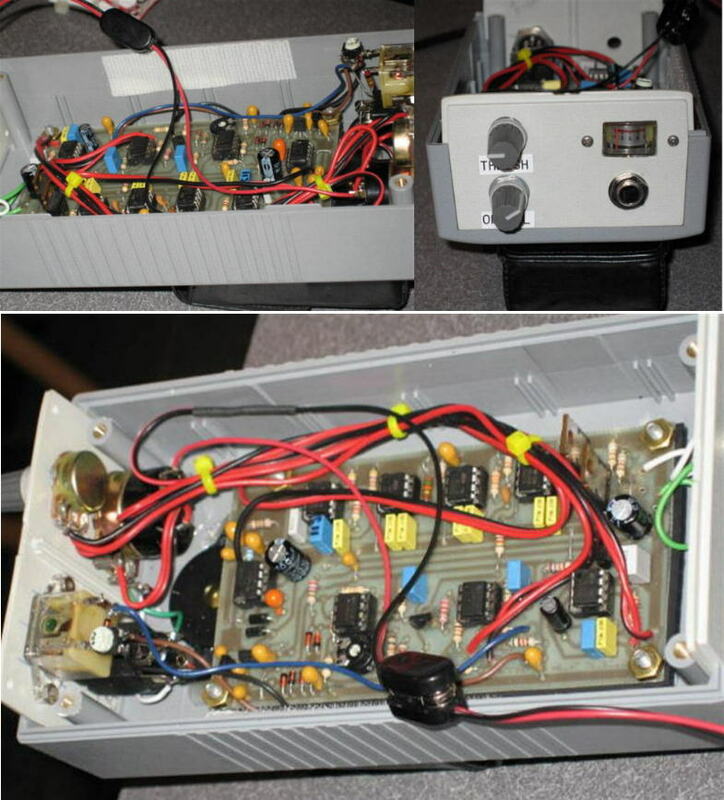 Darrel Re-designed the PCB to make it Fit a Particular box that he liked. 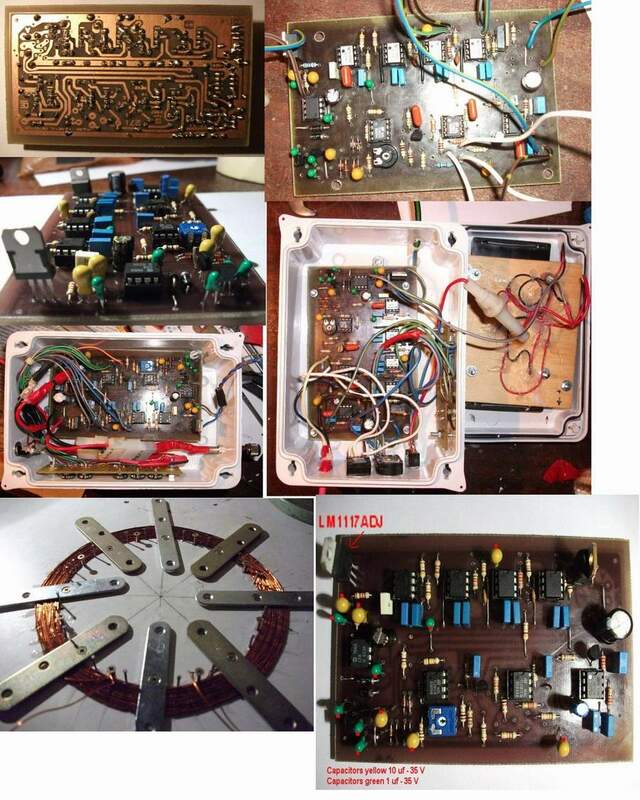 Manu built this himself, Including making the PCB. No parts from me. He says he is Very Pleased with it performance. Just in Assembly Stages. Hopefully More to come. with his 40 inch Coil. His Friends are So Impressed that 3 of them now want my detector and his coil. 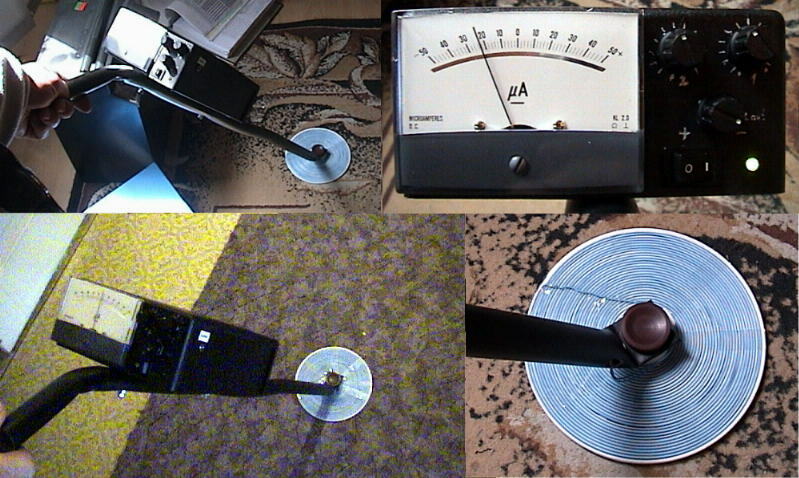 "Alfa Wire", Connected in series. But he says he only used 11 of the 12 wires. Thanks Darren, this info is Much Appreciated! Jochen's Metal Detector in Hildesheim, North Germany. 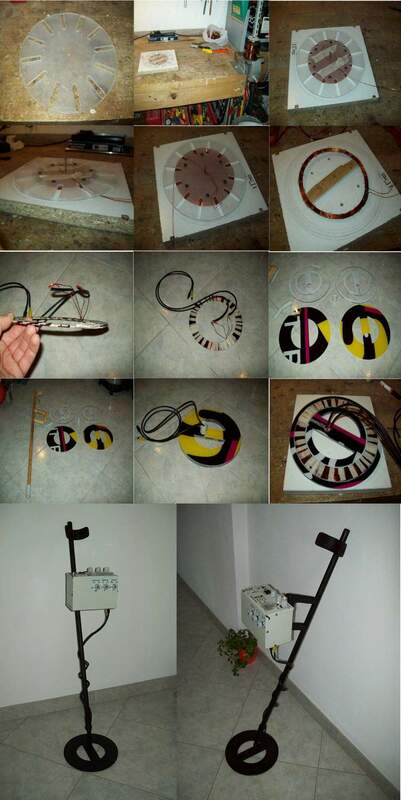 Jochen made Many Coils and sent me a lot of pictures. Too many to post here. that I quit plans for the next time to make a Stronger unit. 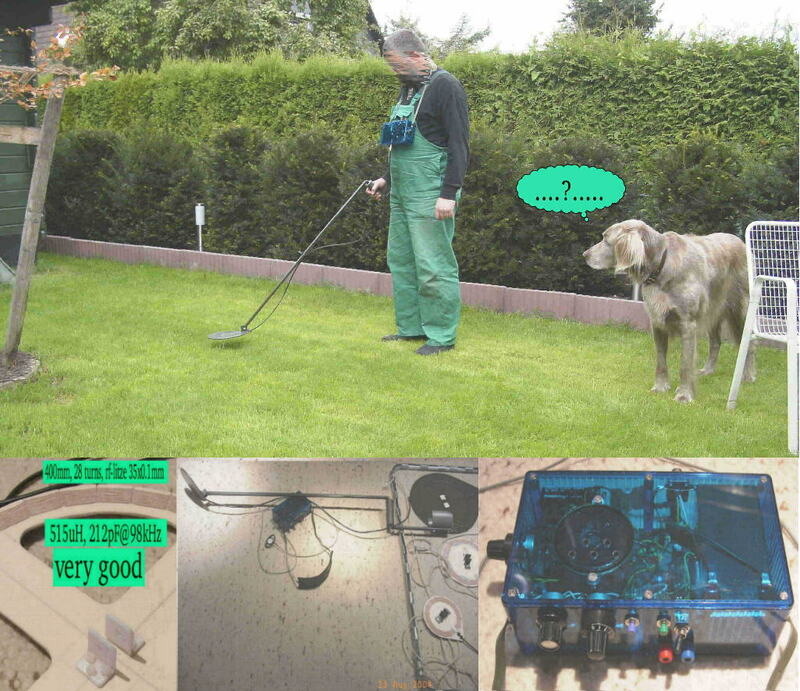 William's Metal Detector in Geel Belgium. William Says he is Very Pleased and Surprised how sensitive the unit is. Quote: "A 50 Eurocent at 8 inches deep is not a problem". He also says he still has more work to do on the unit. The Picture with the boy is his Son "Tim". William supplied most of the parts himself, including the PCB. He had a few problems, But with my help, he got them solved. Excellent Job. Picture includes his Two Sons and a Nephew. The Battery Monitor Jaime used was also taken from my projects. piece of meteorite in the one picture. Picture 1, Michael using his detector. Picture 2, Best Looking Coil Yet. Picture 3, Battery on back of unit. Pictures 4 & 5, His Two possible handle configurations. 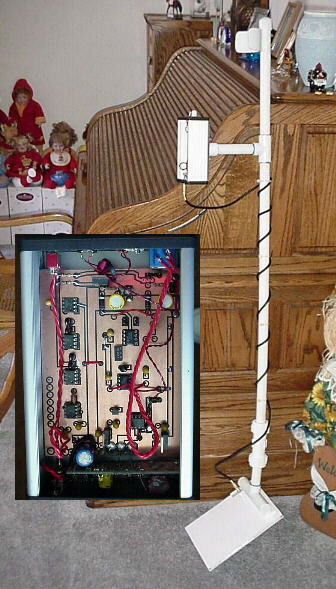 Picture 6, Front View of detector. A Quarter at 12 inches, A Pop Can at 19 inches and a MiniVan at 3 feet. Me: A Very Good Job and I Appreciate Both the Pictures and his Comments. 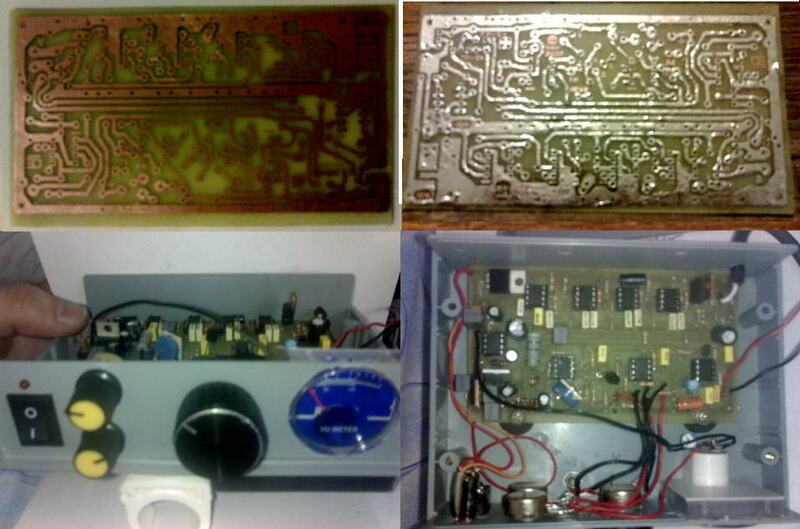 Jeff, 20 y/o made his own circuit board, Very Good Job. He used a battery from a dewalt Drill and made the connector from wood. Jeff had a few setbacks in constructing this, but he is Happy Now. Looks Good Jeff. Thanks for all the pictures, I posted as many as practical. Built it himself, no parts from me. "Looks GOOD Uwe", Have Fun...Gary. His Daughter lost a ring in there garden 3 years ago. With the help of my design he found it. He is Very Happy with the detector. Brad sent me these pic's yesterday (June 9/04). Box fits on his belt. Brad says he has been busy and still needs to finish it and test it. Coil is DD type and water proof. Test Results to come soon, he hopes. This was built with a Digital Meter, and a Frisbee to enclose the coil. "Makes the detector FEEL MUCH LIGHTER". "I Suggest you TRY IT FOR YOURSELF". Again, Note the Reverse Handle, For ease of Balance. Currently Brad's working to get it running on the DD Coil. BRAD: NICE JOB ON MAKING THOSE COILS....Gary. Peter made his own Circuit Board. Says he is very pleased with the detectors performance. Says his unit works Quite Well Under Water. is Really pleased with it. Says it detects a dime at 7 inches. "Sainte Genevieve des Bois, France"
Dan says he can detect a 1 ounce gold piece at 3 feet. As you can see, he is using a multimeter instead of an analogue meter. Go Back to my "HOME PAGE."